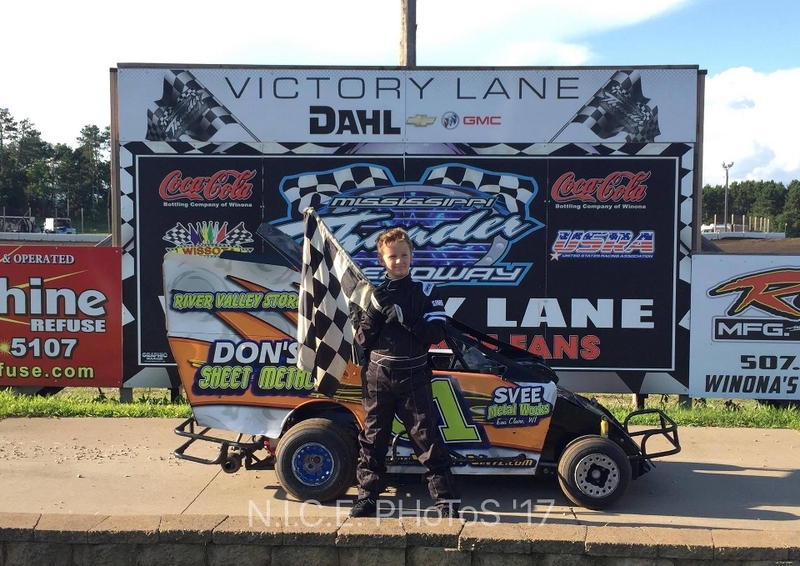 MISSISSIPPI THUNDER SPEEDWAY WRAPS UP 2017 WITH A FUN AND SUCCESSFUL FALL FESTIVAL! Sass, Timm, Hale, & Richards Lead The List Of Feature Winners! With 'Mother Nature' finally cooperating, racers and race fans alike basked in the enjoyment of clear blue skies and comfortable temperatures as they decended on MISSISSIPPI THUNDER SPEEDWAY to wrap up the 2017 season via the rescheduled 9th Annual Fall Festival! Over 215 cars signed into the pits to produce a full night of action that included two roll-overs, a back-to-back double feature winner as well as a side-by-side finish beneath the waiving checkered flags - to decide the winner by thousandths of a second . 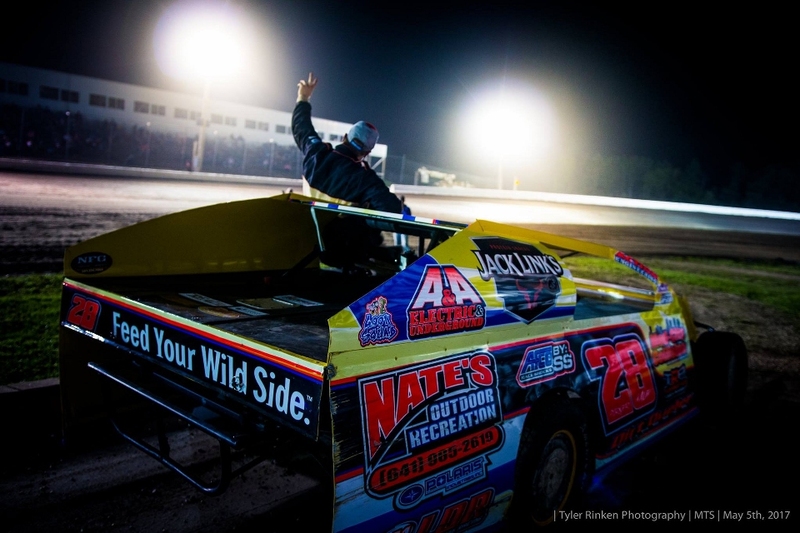 . .
KRIS JACKSON BEATS ADVERSITY AND THE COMPETITION TO CAPTURE THE $10,000-TO-WIN MODIFIED NATIONALS! 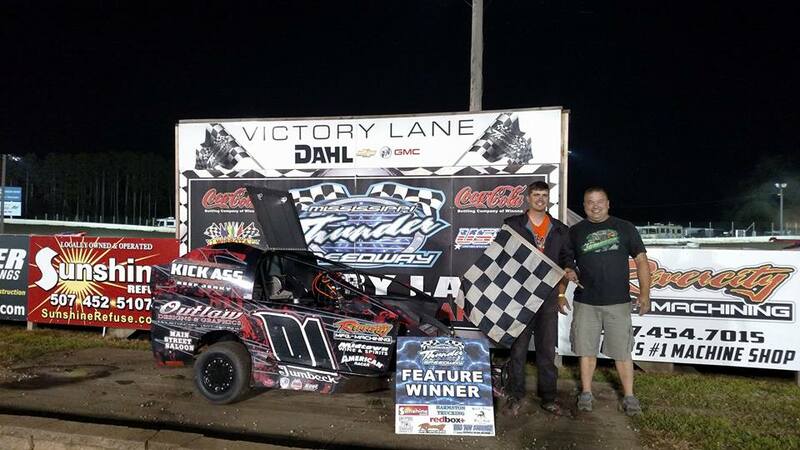 Timm, Sanders & Sorensen Win $2,000, $3,000 & $4,000-To-Win A-Mod Features! 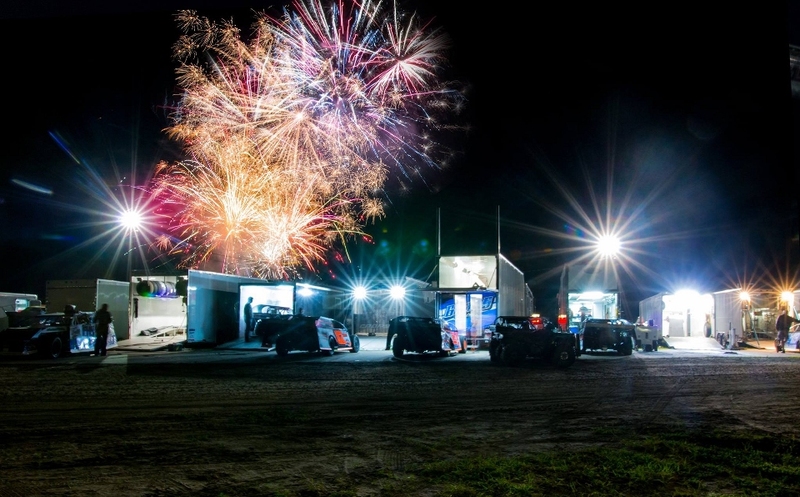 Under crystal clear skies, with perfect temperatures - the "6TH ANNUAL DAHL AUTO PLAZA MODIFIED NATIONALS" presented racers and race fans alike with an exceptional three-day experience to top all others! 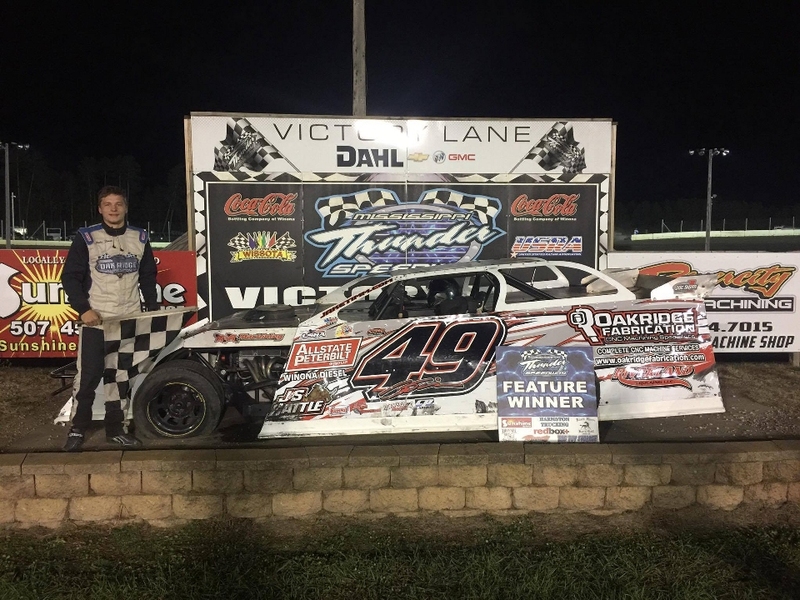 By the time the final checkered flag was waiving, Kris Jackson was hoisting a $10,000 check above his head in the Dahl Chevrolet Buick GMC Victory Lane; while Jake Timm, Rodney Sanders & Dustin Sorensen were celebrating A-Mod feature wins . 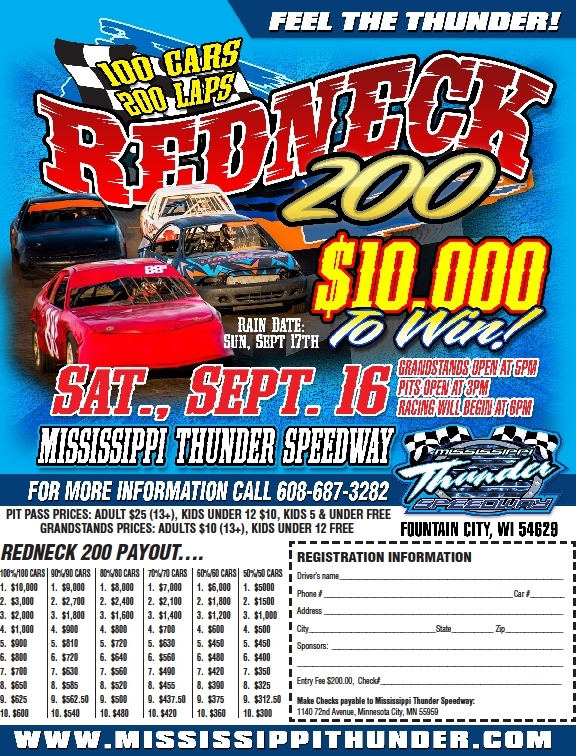 . .
MISSISSIPPI THUNDER SPEEDWAY UPS THE EXCITEMENT WITH THE "$10,000-TO-WIN REDNECK 200"! MISSISSIPPI THUNDER SPEEDWAY is ready to rock the 4-cylinder world with the all new "$10,000-TO-WIN REDNECK 200"! Registration is NOW open for the 2017 "$10,000-TO-WIN REDNECK 200"! Step 2: Fill out registration form (Or write down information on a sheet of paper) and MAIL to MTS 1140 72nd Ave Minnesota City, MN 55959. It must be turned in with the $200 within a week to stay on the entry list. Step 3: Download the MTS phone app to get the latest updates and/or LIKE the Redneck 200 Facebook Event. Rules for the "$10,000-TO-WIN REDNECK 200" are available HERE. CLINTON BUZZES IN FROM IA TO GRAB THE $1,000-TO-WIN HORNET SWARM AT MISSISSIPPI THUNDER SPEEDWAY! Race fans were treated to a tremendous night of racing as almost 150 cars registered into the pits for the final regular season points paying event of the 2017 season - a night that would wrap up battles for 2017 track championships at MISSISSIPPI THUNDER SPEEDWAY, before the big specials ramp up to wrap up the year! Coming into Friday night's event, MANY battles for positions throughout the point standings were still undecided in ALL divisions. 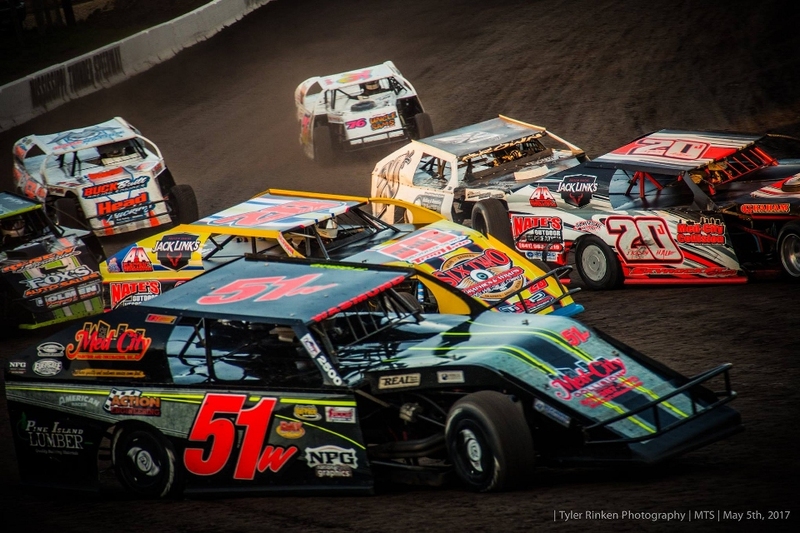 The battles that took center stage and garnered all the attention, however, were for the division championships in the Black Horse Bar & Grill USRA B-Mod division and the redbox+ 600 Mod division. 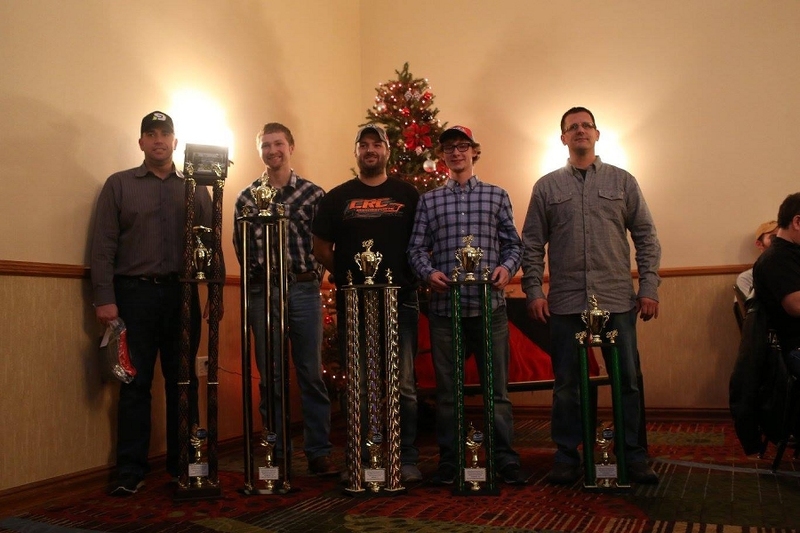 In the Black Horse Bar & Grill USRA B-Mod division four drivers - Alex Williamson (#15W), Parker Hale (#28 - 2015 MTS Track Champion), Erik Kanz (#23K - 2012 MTS Track Champion), & Ryan Olson (#21) - entered the evening separated by just FIVE (5) points! In the redbox+ 600 Mod division four drivers - Bruce Schmitt (#80), Greg Wohletz (#32 - 2012 MTS Track Champion), Chris Gilbertson (#4G - three regular season feature wins @ MTS), & Brad Kramer (#13 - 2 regular season feature wins @ MTS) - entered the evening separated by 62 points. In overall points, the order was Schmitt, Wohletz, Gilbertson, Kramer - but the 600 Mod drivers are allowed to drop their single worst regular season points finish from the total; meaning that after the mathematical gymnastics, the order was Wohletz, Schmitt, Gilbertson, Kramer. While Kramer, down by 46 points, probably didn't stand any chance at a championship - the top 3 (Wohletz, Schmitt & Gilbertson) were only separated by 10 points! Fans were going to need calculators as the evening progressed . 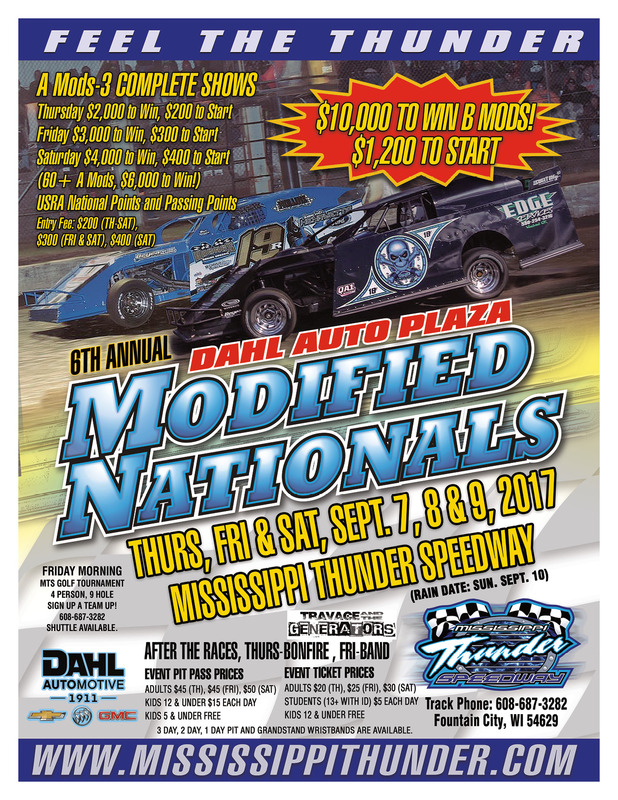 . .
MISSISSIPPI THUNDER SPEEDWAY ALREADY PREPARING FOR 2017 MOD NATIONALS! 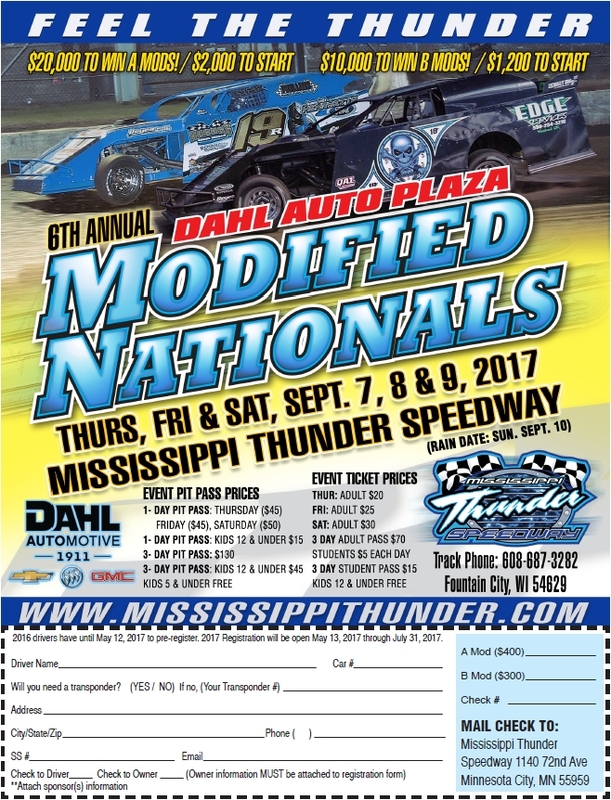 MISSISSIPPI THUNDER SPEEDWAY is already making plans for the 2017 edition of the Modified Nationals! THE 2017 MODIFIED NATIONALS are coming! 2016 competitors have first opportunity to sign up, and then it will be OPEN to anyone on May 15th! This year, it is the first 240 cars to register. Same rules as 2016, but different qualifying rules. Please call 608-687-3282 with questions. Stay tuned to the official MTS web site (www.MississippiThunder.com) or the MTS FaceBook page as details emerge. MISSISSIPPI THUNDER SPEEDWAY is excited to release the following announcement designed to allow WISSOTA-Type Modified competitors to join the fun racing with the highly competitive Rivercity Manufacturing USRA Modified division during the 2017 season! "Attention Modifed drivers: New for 2017 MISSISSIPPI THUNDER SPEEDWAY will allow WISSOTA-Type Modifieds to run their rule package on the Hoosier tire. The only exception will be that regardless of your WISSOTA type engine package nobody utilizing the Hoosier tire will be allowed to have a spoiler over 5". There will be no mixing of rules. You will still need to buy a USRA License temp or permanent to race. Below is the the 2017 Payout for Modifieds that will include a $600.00 added pay spot when we have 20 cars or more. This payout ALSO includes a $100.00 winner's bonus thanks to Wehrs Machine! Please spread the word and lets see if we can hit the 20 car mark every week!" 20+ Mod Payout at MISSISSIPPI THUNDER SPEEDWAY! THE SWARM IS COMING TO MISSISSIPPI THUNDER SPEEDWAY!! 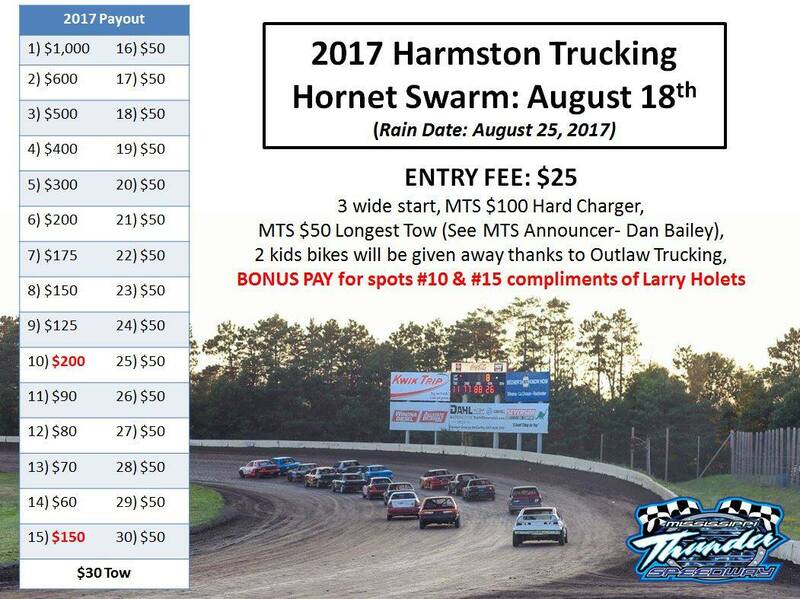 MISSISSIPPI THUNDER SPEEDWAY is excited to welcome the excitement of the 3rd Annual Harmston Trucking Hornet Swarm to Friday night action August 25th. With a high number of competitors in prior year's events . . . fans and competitors alike will be amazed by the action this 'entry-level division' can produce! 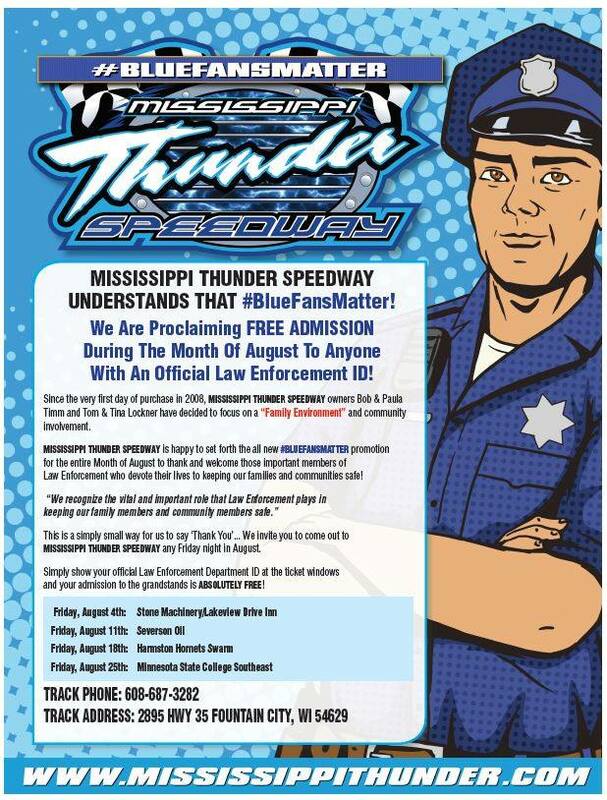 The #BlueFansMatter promotion invites any and all members of Law Enforcement to enjoy a night at MISSISSIPPI THUNDER SPEEDWAY compliments of the speedway. Simply show your official Law Enforcement Department ID at the ticket windows and your admission to the grandstands is ABSOLUTELY FREE, any Friday night of August during the 2017 season. 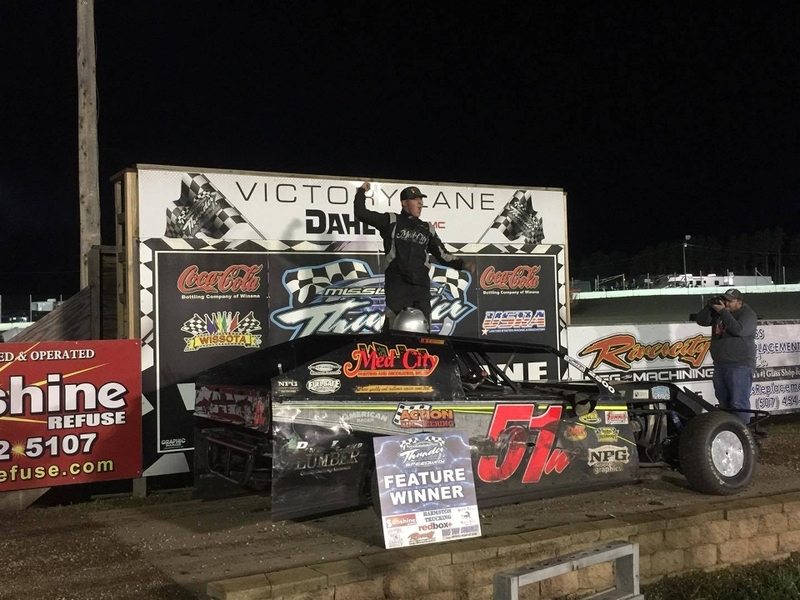 KANZ, ANGST & JUMBECK RACE BACK TO VICTORY LANE AT MISSISSIPPI THUNDER SPEEDWAY! 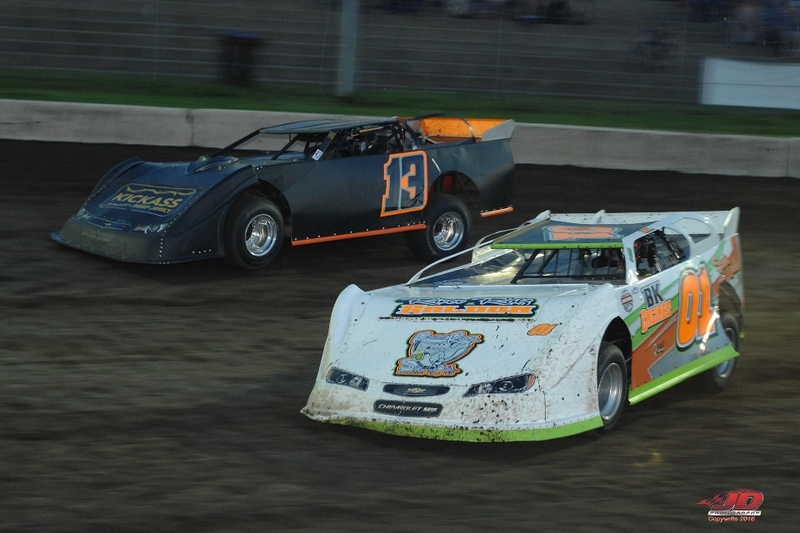 Severson Oil Night produced a fast night of high-speed action at at MISSISSIPPI THUNDER SPEEDWAY! 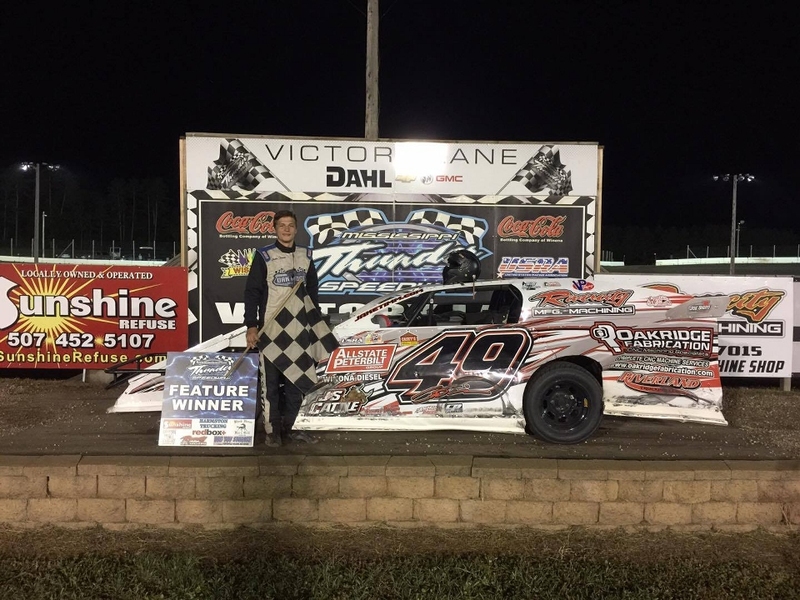 Josh Angst his third Rivercity Manufacturing USRA Modified feature win of the 2017 season. 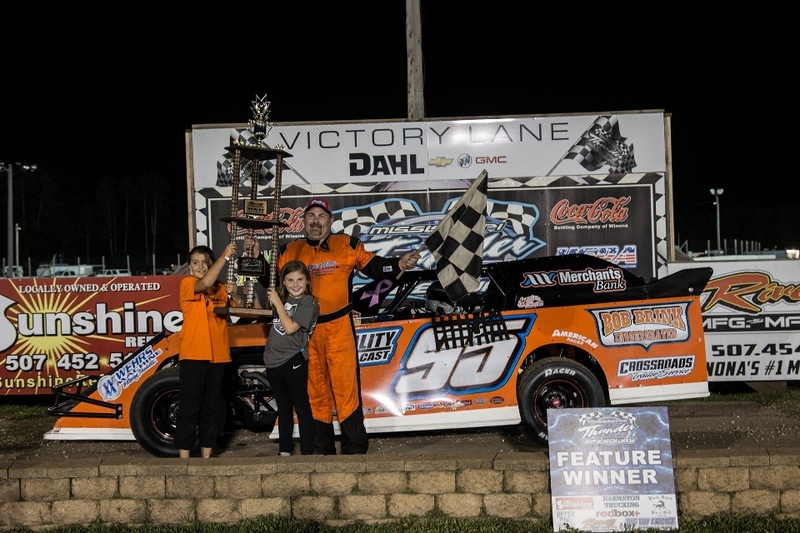 Lance Hofer held off some tough competition to capture win #9 in the Centerville Welding & Repair USRA Late Model division presented by Big Toy Storage. 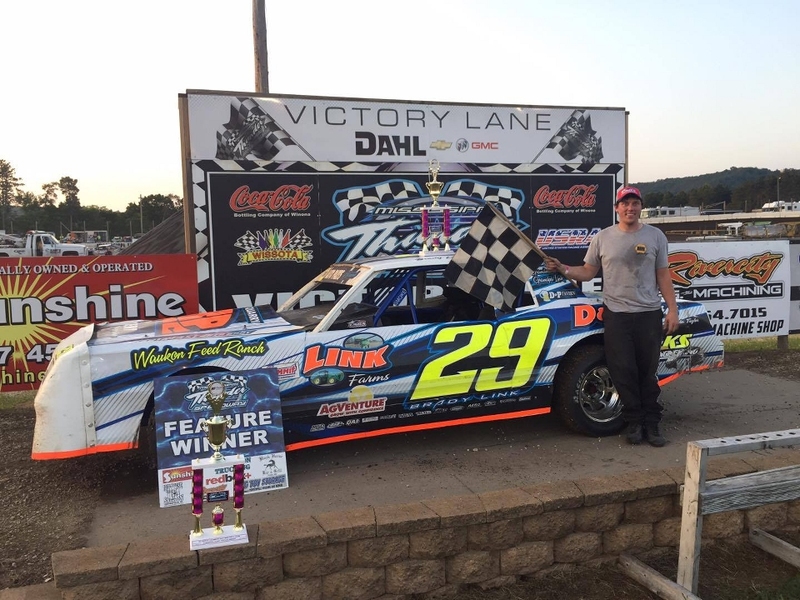 And former MTS Track Champion Erik Kanz rebounded from a bit of a mid-season slump to tighten up the points chase with his fourth Black Horse Bar & Grill USRA B-Mod feature win . . .
TRACK CREW AND FANS WORK TOGETHER TO BEAT THE RAIN AT MISSISSIPPI THUNDER SPEEDWAY! Lakeview Drive Inn / Stone Machinery / Winona Culvers Night at MISSISSIPPI THUNDER SPEEDWAY started with sunshine and blue skies over head; but by midway through the evening's heat races, the clouds had rolled in and a heavy downpour began a 90 minute rain delay that completely changed the complexion of the evening! After the track crew, and volunteers from the grand stands, had re-packed the track, the competition was fast and furious through the final checkered flag . 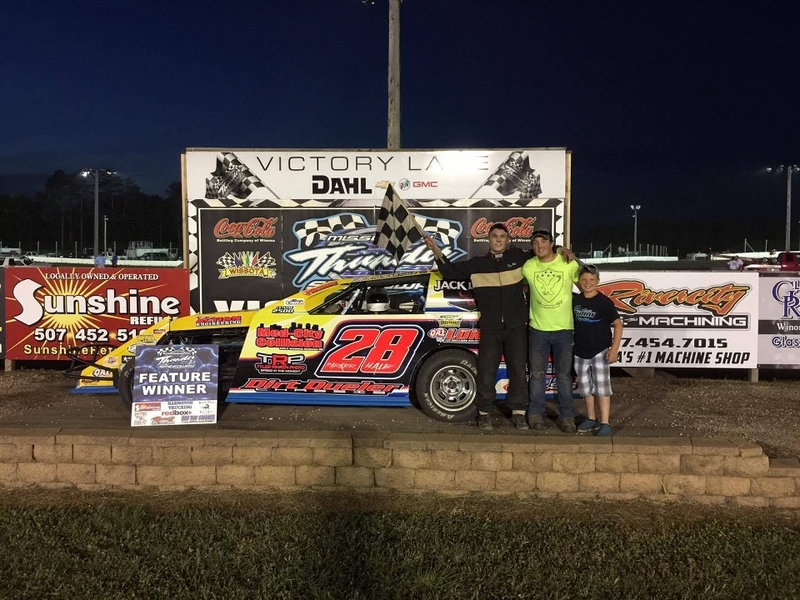 . .
SHAUN WALSKI RACES TO BAEHMAN LAW B-MOD CHALLENGE WIN AT MISSISSIPPI THUNDER SPEEDWAY! Fastenal / Minnesota State College Southeast night brought with it The 9th Annual Baehman Law B-Mod Challenge to MISSISSIPPI THUNDER SPEEDWAY - with extra money on the line and a full grand-stands, Shaun Walski waltzed his way into Victory Lane with his #95 Dirt Dueller Modified that seemed tuned to perfection! 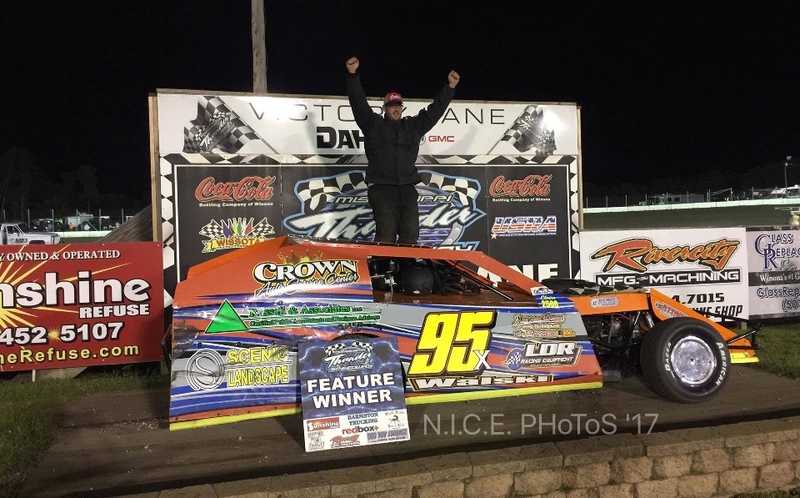 Additionally, Adam Hensel and Travis Krause picked up their first USRA Feature wins of 2017 at MTS while Brad Kramer returned for his second straight 600 Mod Feature win as Dan Hovden handled the visiting USRA Stock Cars . 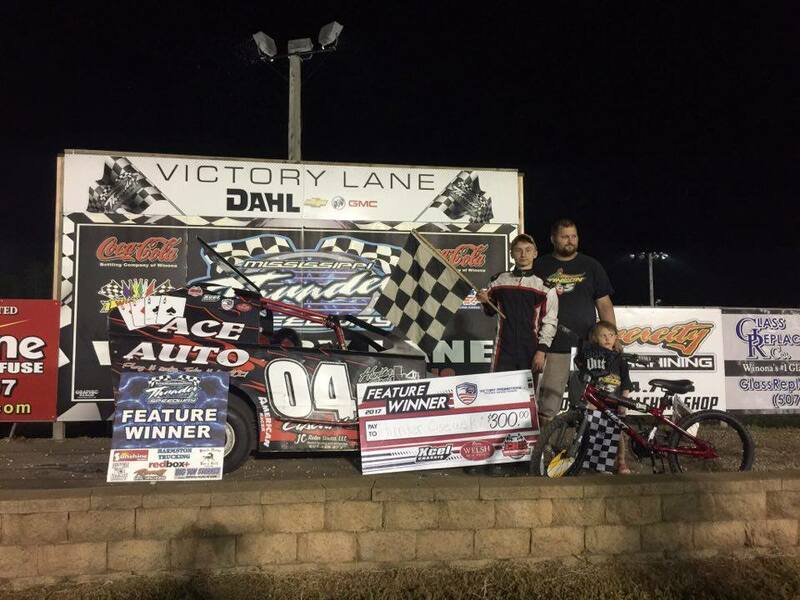 . .
FOSS DOUBLES UP WHILE KRAMER, WILLIAMSON, LUDEKING, TOURTELLOTT RACE TO FIRST FEATURE WINS OF 2017! 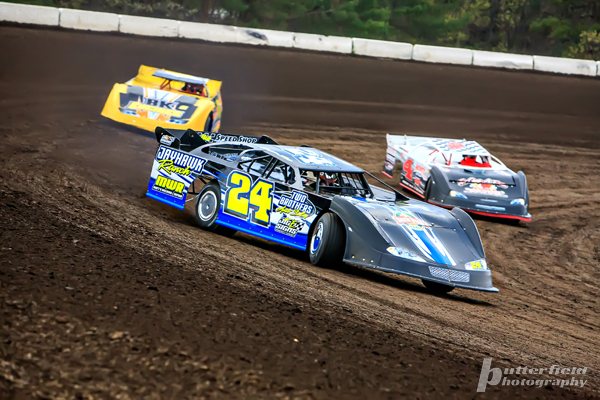 Fans were treated to amazing on-track battles during Winona Diesel / Allstate Peterbuilt night, during the third Friday night of racing at MISSISSIPPI THUNDER SPEEDWAY! 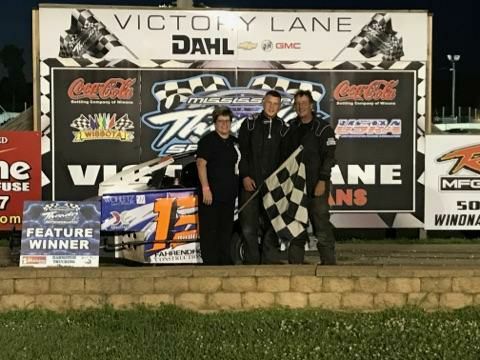 Keith Foss backed up his Rivercity Rumble win the previous week with his second straight feature win, while Alex Williamson, Brad Kramer, Jushua Ludeking, & JR Tourtellott enjoyed their very first trips to victory lane . 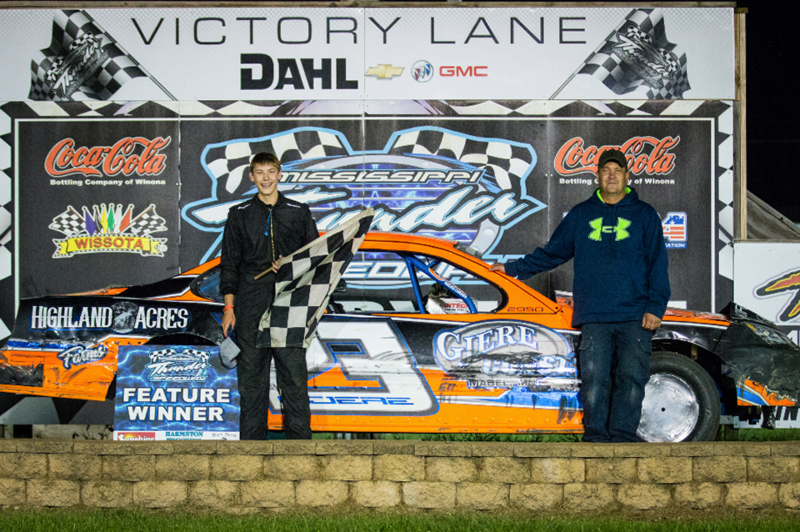 . .
FOSS & OLSON TAKE 9TH ANNUAL RIVERCITY RUMBLE WINS! 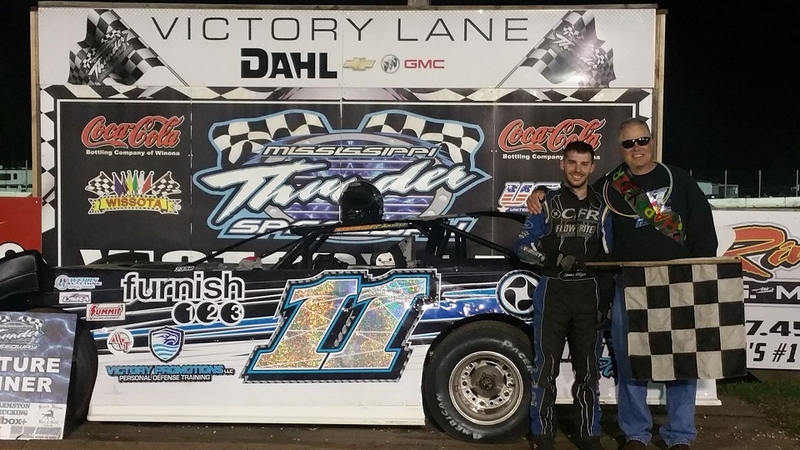 After "Mother Nature" doused the hopes of race fans the prior Friday evening, MISSISSIPPI THUNDER SPEEDWAY came back for a second week and ramped up the excitement in order to bring the 9th Annual Rivercity Rumble to the fans and racers alike! As the evening closed, fans witnessed impressive battles throughout the large count of competitors and for every position on the track - wrapped up with Ryan Olson and Keith Foss grabbing the huge hardware and large payout as winners of the Rivercity Rumble features in the Black Horse Bar & Grill USRA B-Mod and Rivercity Manufacturing USRA Modified divisions respectively . . .
MISSISSIPPI THUNDER SPEEDWAY IS READY TO RUMBLE!! 2015 & 2016 were record-setting years for attendance during the July 4th weekend presentation of the Rivercity Rumble . . . MISSISSIPPI THUNDER SPEEDWAY is looking forward to replicate that experience in 2017! 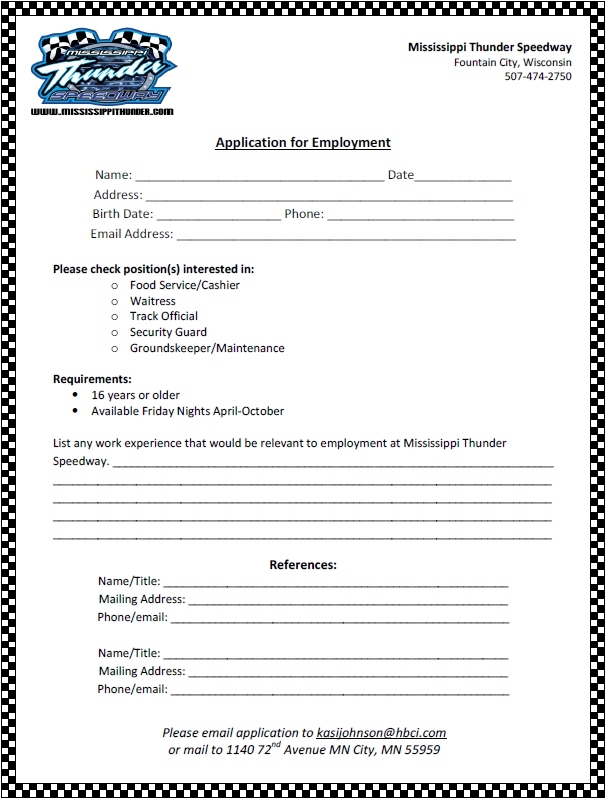 This week, MISSISSIPPI THUNDER SPEEDWAY released full details regarding the 2017 Rivercity Rumble with a printable FULL-COLOR copy (both pdf and image version) of the event flyer and registration document! "The turnout, by both fans and racers, over the years has always been great for the Rivercity Rumble", said MTS owner Bob Timm, "so we're always really excited as we start looking towards the Rumble for 2017!" 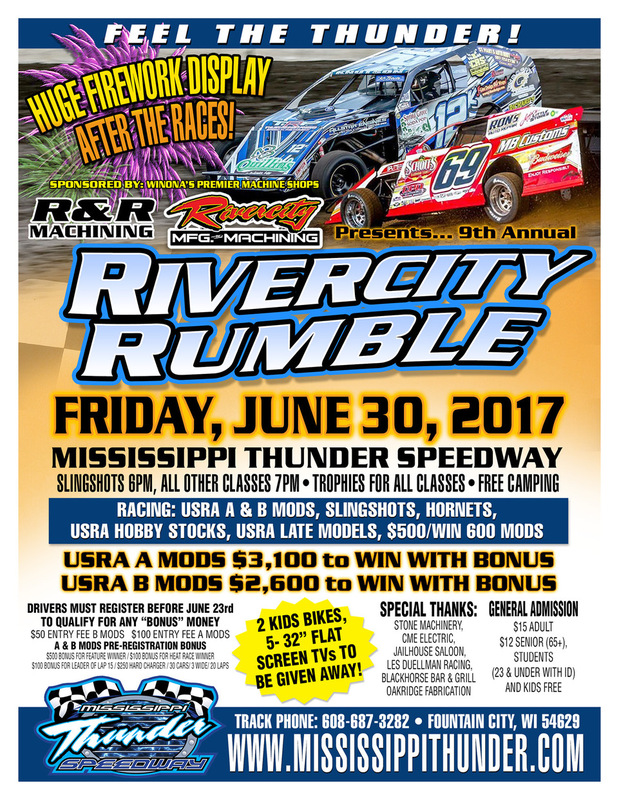 The NINTH ANNUAL River City Rumble is coming to MISSISSIPPI THUNDER SPEEDWAY Friday June 30th. But drivers MUST Pre-Register by June 23rd for A & B mod bonus money! 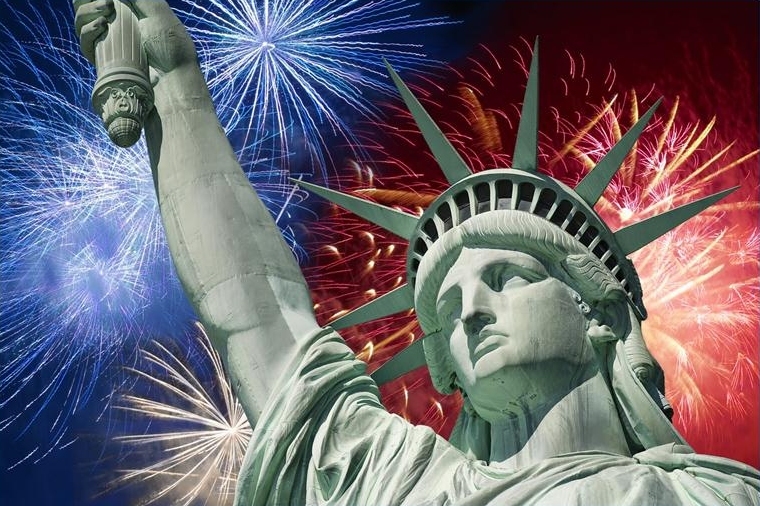 Also, witness the huge fireworks display for the perfect start to the upcoming 4th of July celebrations! CELEBRATIONS OF VICTORY AT MISSISSIPPI THUNDER SPEEDWAY! 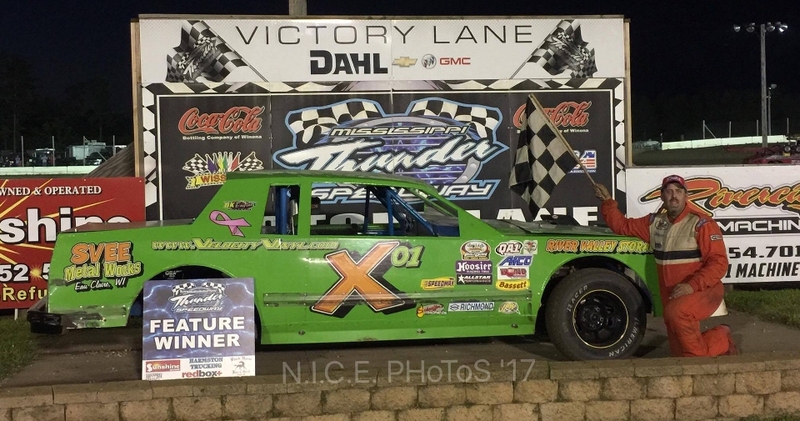 Despite some showers that zipped through the area, creating an almost 40-minute delay at MISSISSIPPI THUNDER SPEEDWAY Friday night, racers and fans alike all stuck around - and were rewarded with an exceptional night of action all the way through the final checkered flag! Motor Parts & Equipment / WIX Filters / Schaeffer Oils night proved to be an exciting event that entertained all on hand! 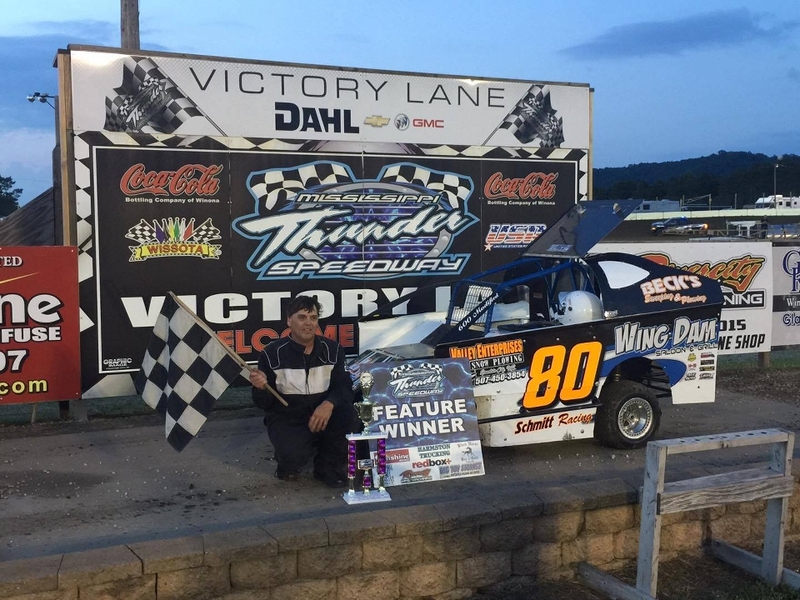 The crowd (who helped raise almost $1,000 for the Winona Figure Skating club) witnessed the first feature wins of the year at MISSISSIPPI THUNDER SPEEDWAY for John Doelle, JT Wasmund, Scott Spilde, & Jason Bauer . . . 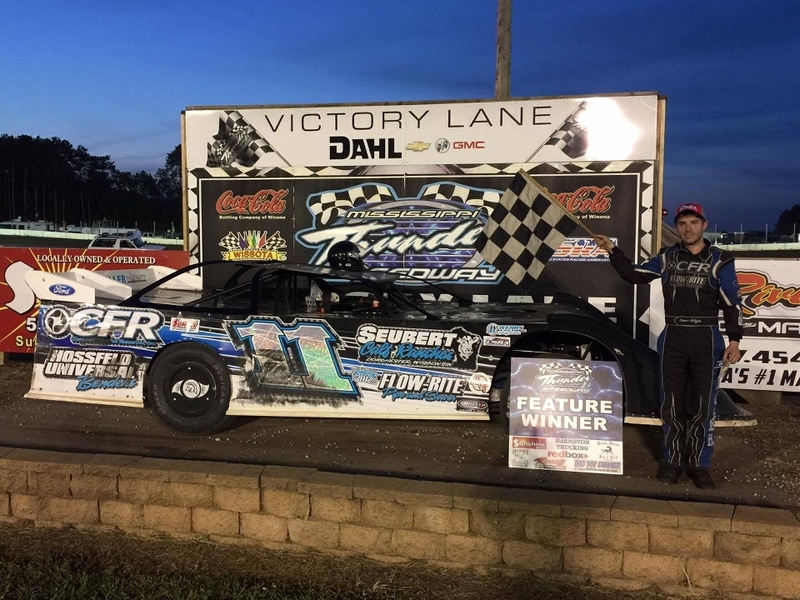 HOMETOWN FAN-FAVORITE BRUCE SCHMITT GRABS THE GLORY AT MISSISSIPPI THUNDER SPEEDWAY! The 1st Annual Steamboat Days Race For A Cause presented by Miller Ingenuity has been deemed a success at MISSISSIPPI THUNDER SPEEDWAY! 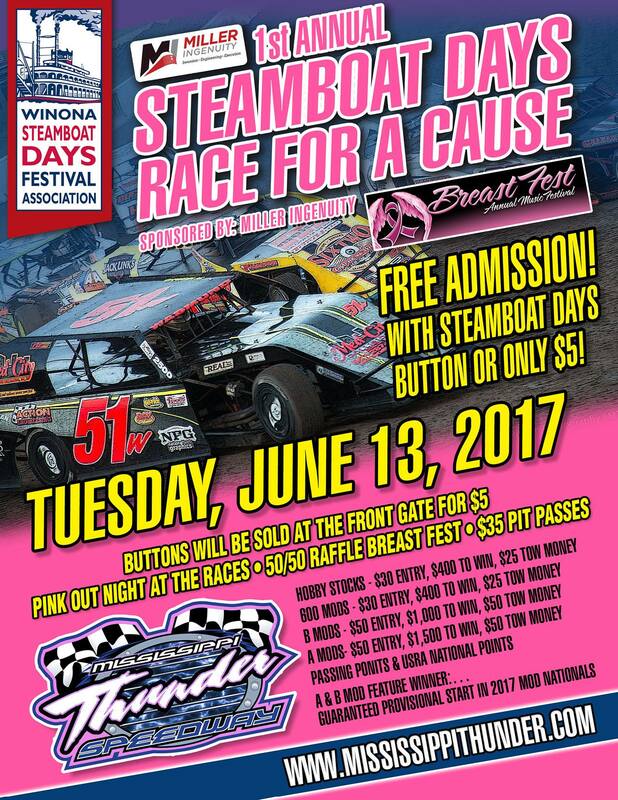 The Tuesday night program opened the 2017 Steamboat days celebration, brought dignitaries to the track, opened the sport to non-typical fans, & raised more than $1000 for Breast-Fest! In front of all these positives, the crowd really cheered when Hometown Fan-Favorite Bruce Schmitt held off repeated challenges from the #32 Miller Ingenuity 600 Mod of former Track Champion Greg Wohletz to grab a feature win! 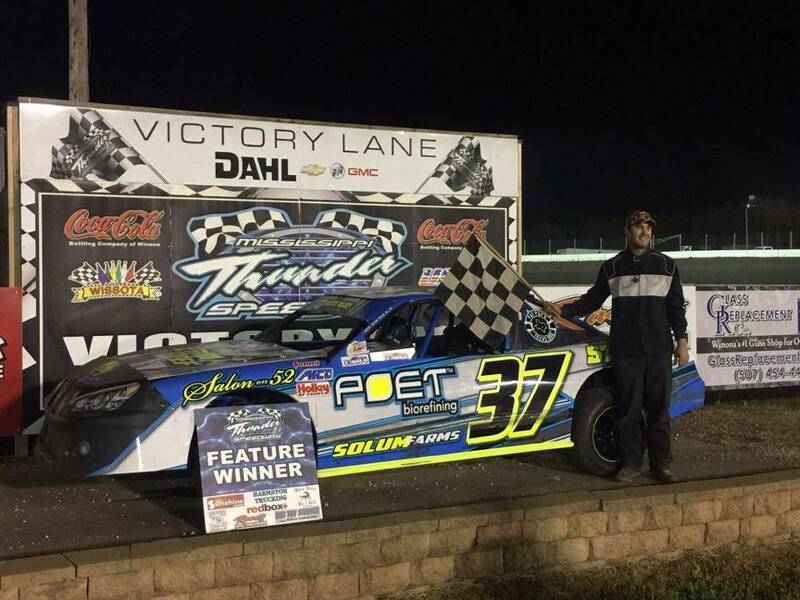 3-Time, and defending, Track Champion Josh Angst grabbed the $1500-To-Win Rivercity Manufacturing USRA Modified feature win - and in doing so, also won a guaranteed provisional starting spot in this September's huge 2017 Modified Nationals at MTS! 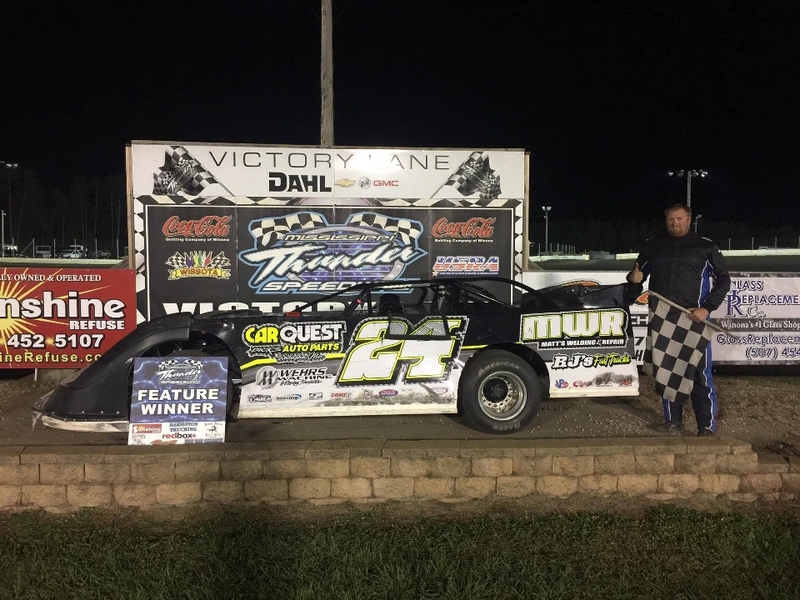 Defending, Track Champion Ben Moudry grabbed the $1000-To-Win Black Horse Bar & Grill USRA B-Mod feature win - and also won a guaranteed provisional starting spot in this September's huge 2017 Modified Nationals at MTS! 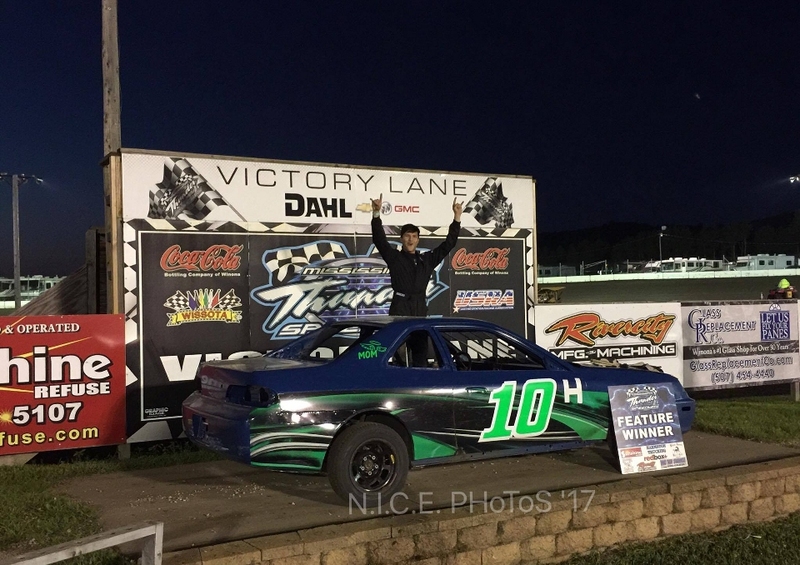 Brady Link continued his strangle hold on the Jailhouse Saloon USRA Hobby Stock division - grabbing his 5th feature win of the young 2017 season! 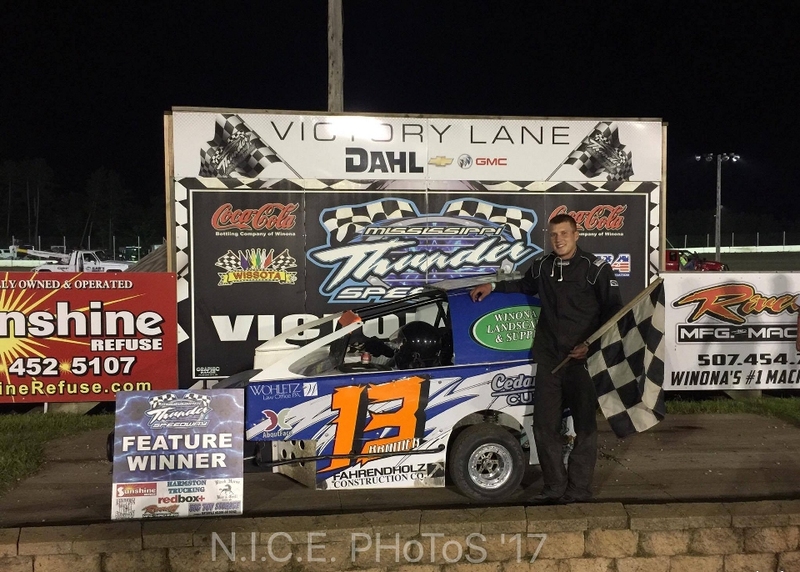 JAKE TIMM GRABS FEATURE WIN DURING BIG-MONEY NIGHT AT MISSISSIPPI THUNDER SPEEDWAY! 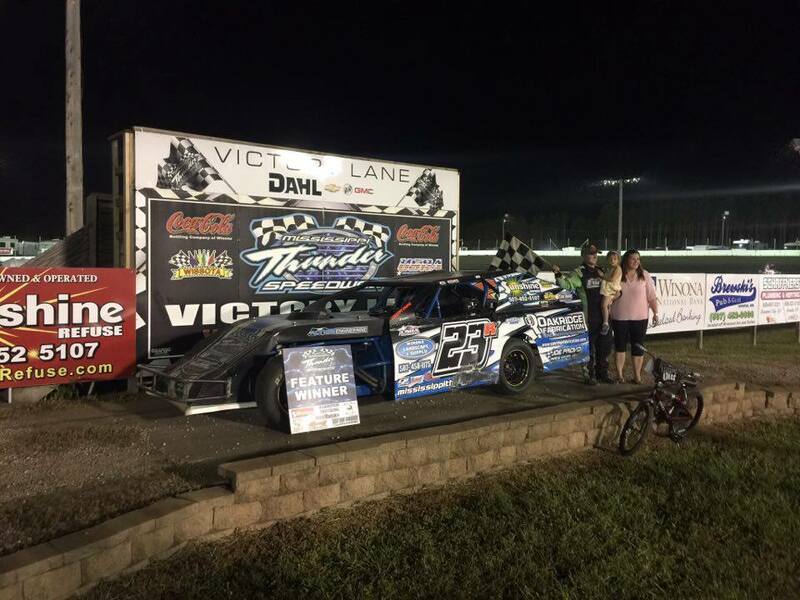 Black Horse Bar & Grill / Winona Sign & Designs Night produced action and excitement at MISSISSIPPI THUNDER SPEEDWAY Friday evening! 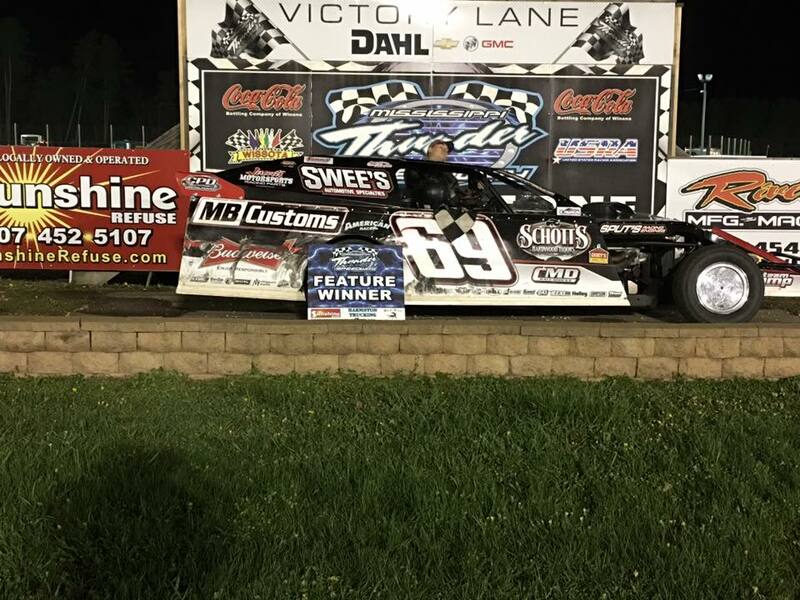 With Erik Kanz riding a three-win streak in the Black Horse Bar & Grill USRA B-Mod Division, and Lance Hofer enjoying an unbeaten streak - $100 bonuses were placed on each driver, awarded to the racer who could break those streaks with a feature win. In return, sponsors of Kanz and Hofer made a return bonus offer of $100 and $200 respectively if they could keep their streaks going! At the same time, the redbox+ 600 Mods were racing for more than double the money in a $700-to-win event offered by The Black Horse and Winona Student Homes. 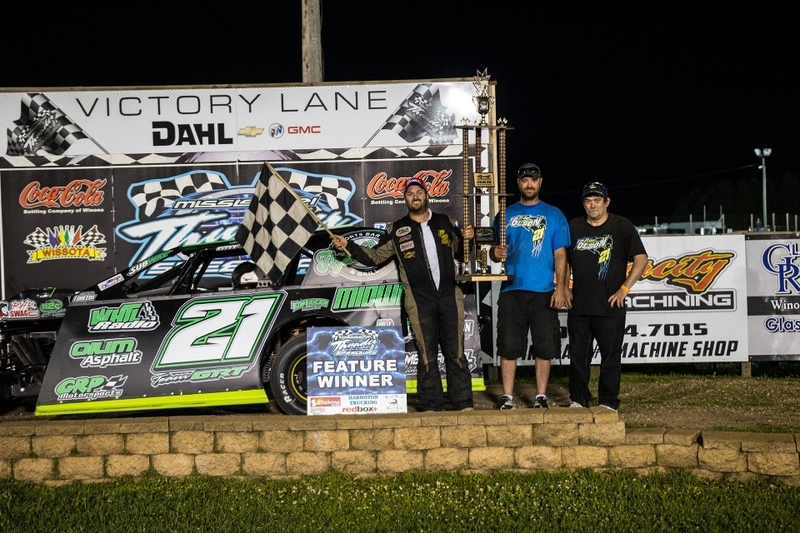 And while all this money was floating around, Jake "The Snake" Timm stepped his efforts up and won the Rivercity Manufacturing USRA Modified feature . . .
MISSISSIPPI THUNDER SPEEDWAY IS READY FOR A PINK OUT! MISSISSIPPI THUNDER SPEEDWAY is bringing back a little mid-week fun with the 1st Annual SteamBoat Days Race For A Cause - Presented by MILLER INGENUITY! Free Admission with a Steamboat Days button (and we'll even be selling them at the front gate)! This will also be our 2017 "PINK OUT Night" with funds from the 50/50 ticket sales going directly to "Breast Fest" - Breast Cancer awareness and fight for a cure. Jailhouse Saloon USRA Hobby Stocks along with the REDBOX+ 600 Mods will be racing for $400-To-Win! 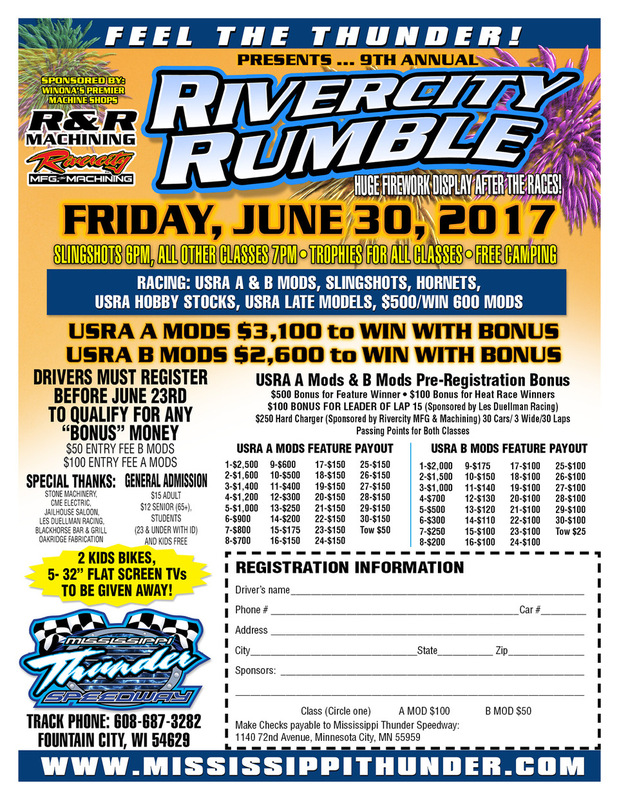 Rivercity Manufacturing USRA Modifieds will hit the track for $1,500-To-Win! 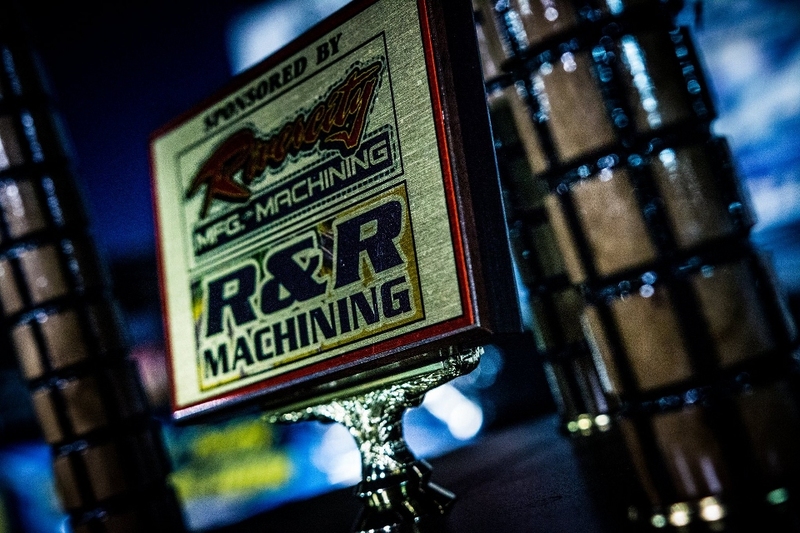 Black Horse Bar & Grill USRA B-Mods will be gunning for $1,000-To-Win! In addition to the cash . 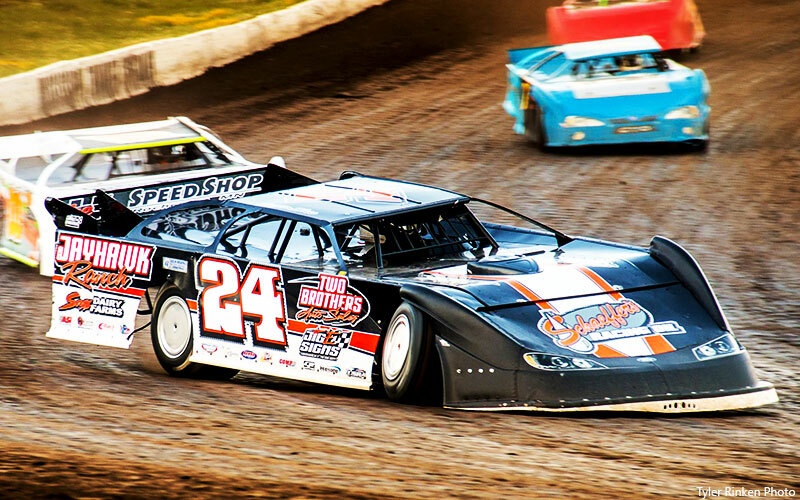 . . the winners of the USRA Modified and USRA B-Mod features will be awarded a GUARANTEED PROVISIONAL STARTING POSITION in the 2017 MOD NATIONALS! 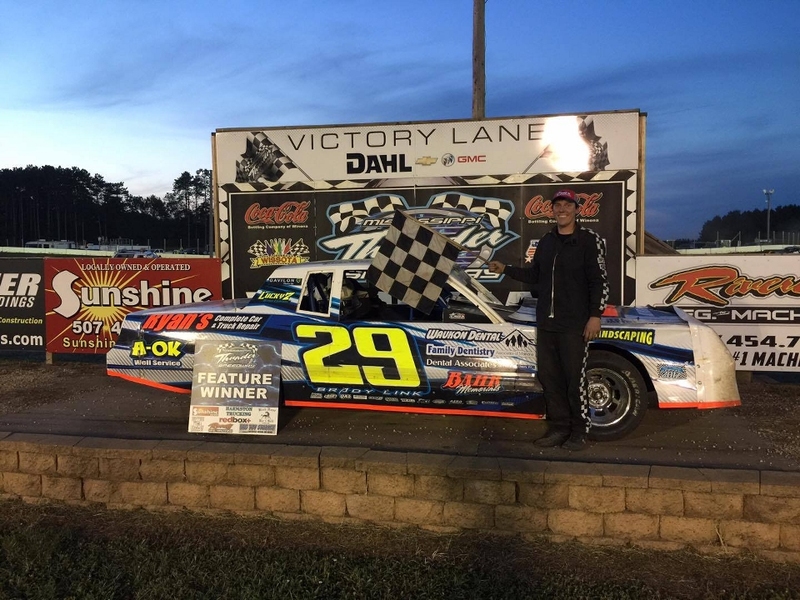 KANZ TRIPLES-UP AS NAPA NIGHT PRODUCES HIGH EXCITEMENT AT MISSISSIPPI THUNDER SPEEDWAY! With the Rivercity Manufacturing USRA Modifieds off for the night, race fans needn't worry that there would be a shortage of excitement during NAPA Night at MISSISSIPPI THUNDER SPEEDWAY! The introduction of USRA Stock Cars and a visit by the Victory Promotions 600 Mod Touring Series to the night's scheduled (completed with weekly regular classes Black Horse Bar & Grill USRA B-Mods, Centerville Welding & Repair USRA Late Models presented by Big Toy Storage and the Harmston Trucking MTS Hornets insured that the on-track action would be just as hot as always! By the waiving of the evening's final checkered flag - most race fans headed to their own cars in the parking lot or the pits for autographs were in agreement with one race fans' vocalizations over the Speedway P.A. system, "Weekly racing like that - there's none better anywhere else!" . 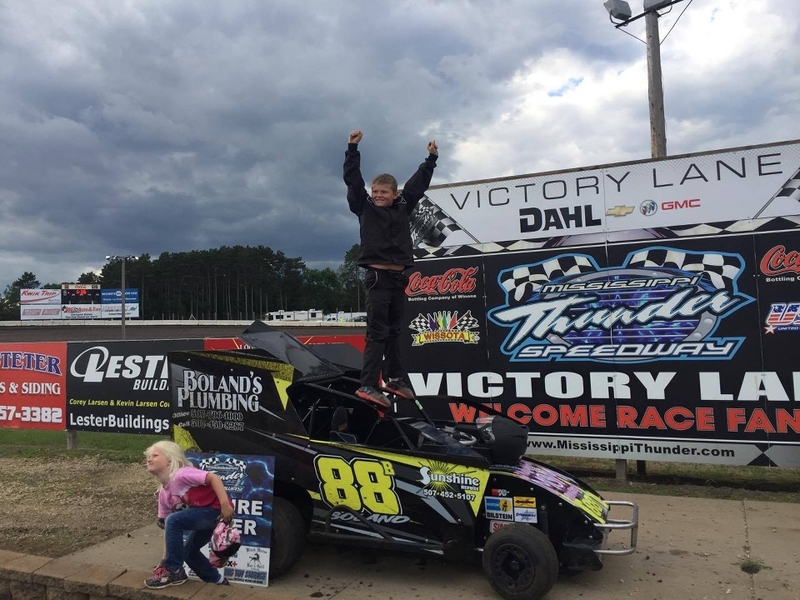 . .
GUSTIN GRINDS ONE OUT FOR GRANDPA D, OUTGUNS DILLARD IN MISSISSIPPI THUNDER SPEEDWAY THRILLER! 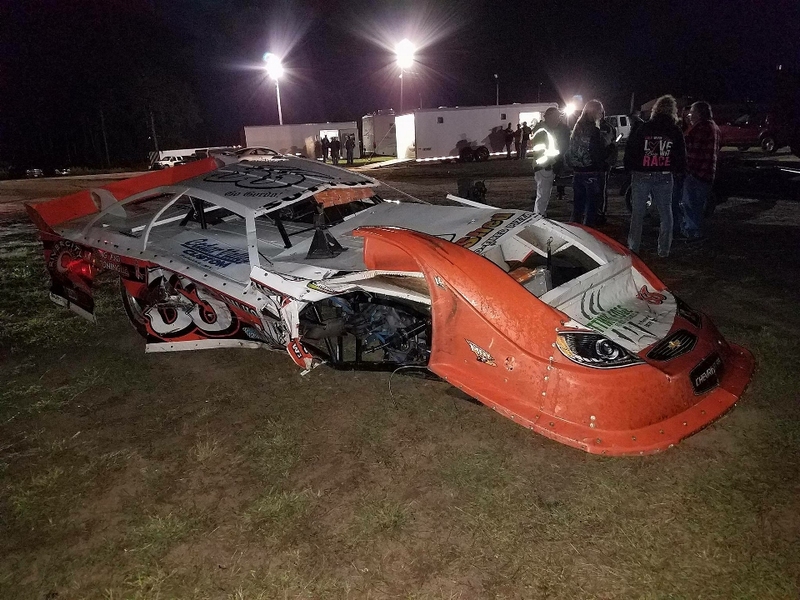 The worst part about the checkered flag waving at the conclusion of the USMTS main event Friday night at the MISSISSIPPI THUNDER SPEEDWAY was that it had to end. The best part was that everybody in attendance was finally able to take a breath. Bob Timm’s reshaping and resurfacing of the Fountain City, Wis., oval during the off-season paid dividends with a 40-lap feature race that could have been called great even without the incredible hair-raising final five laps. 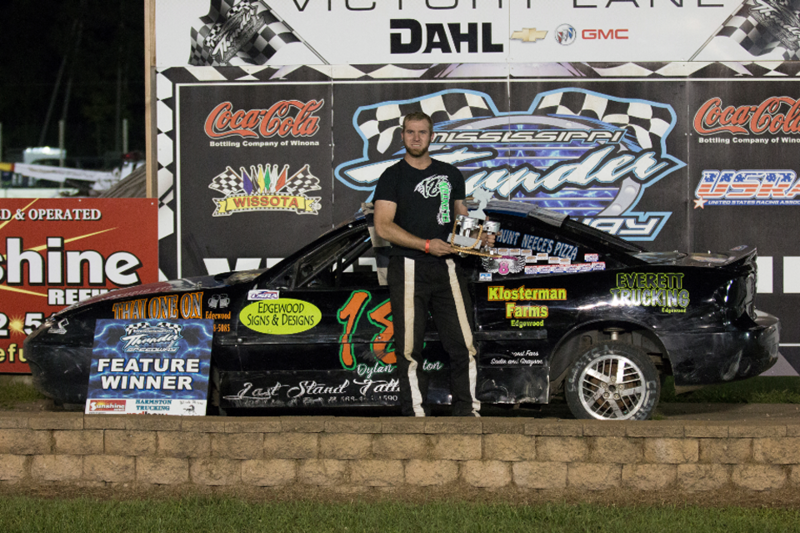 But despite a new look and feel, victory lane felt just like old times with Ryan Gustin holding the winner’s paycheck. 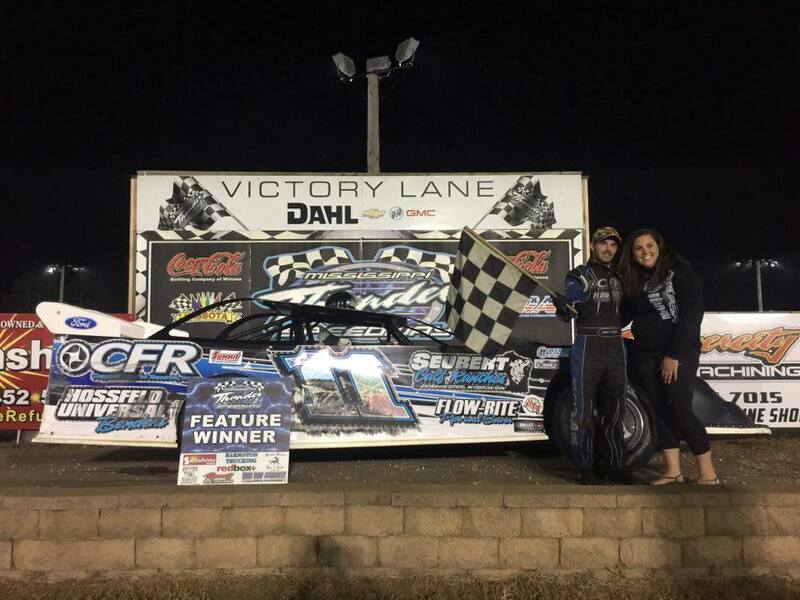 It was his fourth career USMTS win at the track, and second straight going back to last fall’s $40,000-to-win USRA Modified Nationals where Gustin edged Scott Bloomquist for the colossal payday . 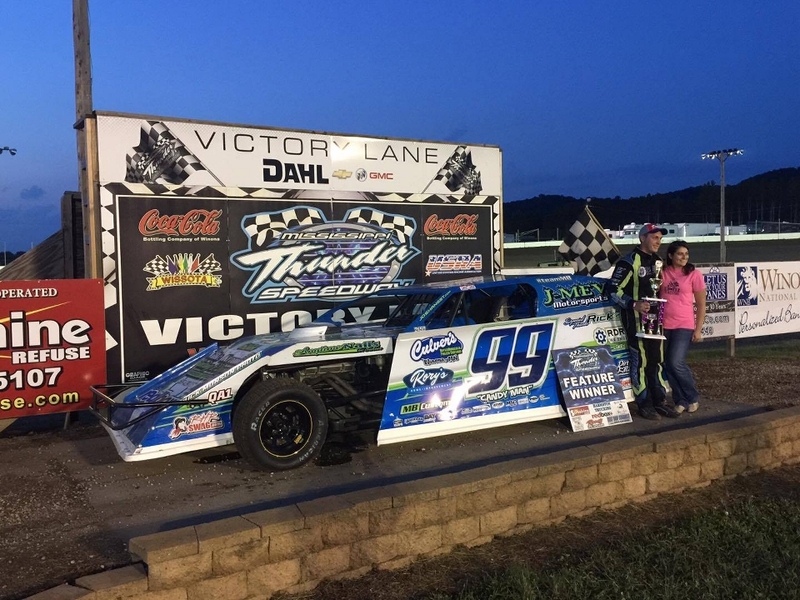 . .
WILD COUNTRY 99 / BUD NIGHT EXCITES ALL AT MISSISSIPPI THUNDER SPEEDWAY! Friday nights are heating up quickly! 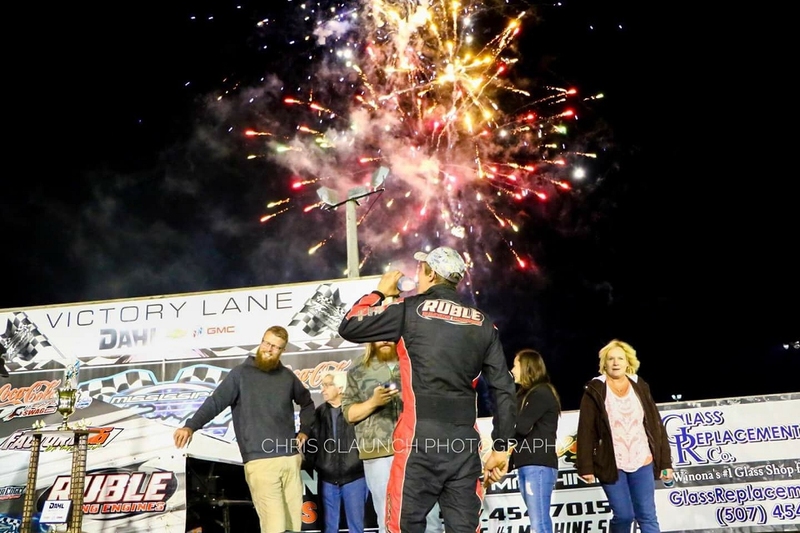 Blue sky, Sunshine, Amazing competition, & fun for the fans and racers alike took over the spot light Friday night May 12th as WILD COUNTRY 99 / BUDWEISER Night exploded with fun and excitement at MISSISSIPPI THUNDER SPEEDWAY! Many in attendance found out, or were reminded once again, just why the Black Horse Bar & Grill USRA B-Mod division is the most popular class at MISSISSIPPI THUNDER SPEEDWAY . . .
MISSISSIPPI THUNDER SPEEDWAY CELEBRATES CINCO DE MAYO! Week number two of the 2017 Season at MISSISSIPPI THUNDER SPEEDWAY brought out the fast and furious fun that comes around every year with a Cinco De Mayo celebration! Olé! After an honestly chilly Opening Night the Friday prior . . . the Friday night weather conditions for the Cinco De Mayo celebration at MISSISSIPPI THUNDER SPEEDWAY down-right perfect. Blue sky, sunshine, and temperatures that were just right. As fans enjoyed the perfect weather, the racers were enjoying the perfect racing surface on the newly reconfigured high-banked 'Big 1/3-Mile'. Three, Four, Five-wide racing for positions were pretty much the norm through the evening as a quick low groove was matched by the wide-open fast high-groove . . . while both were equally tested by drives choosing from two to three other options in between. 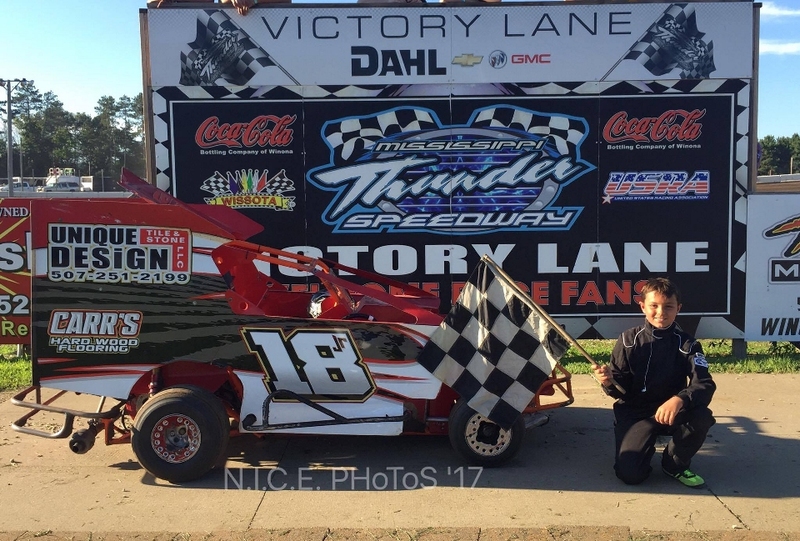 By the end of the evening, Lucas Schott has once again bested his former Slingshot buddy Jake Timm, former National Champion Cory Crapser and former MISSISSIPPI THUNDER SPEEDWAY Track Champions Josh Angst and John Doelle to make a repeat visit to the Dahl Auto Plaza Victory Lane. 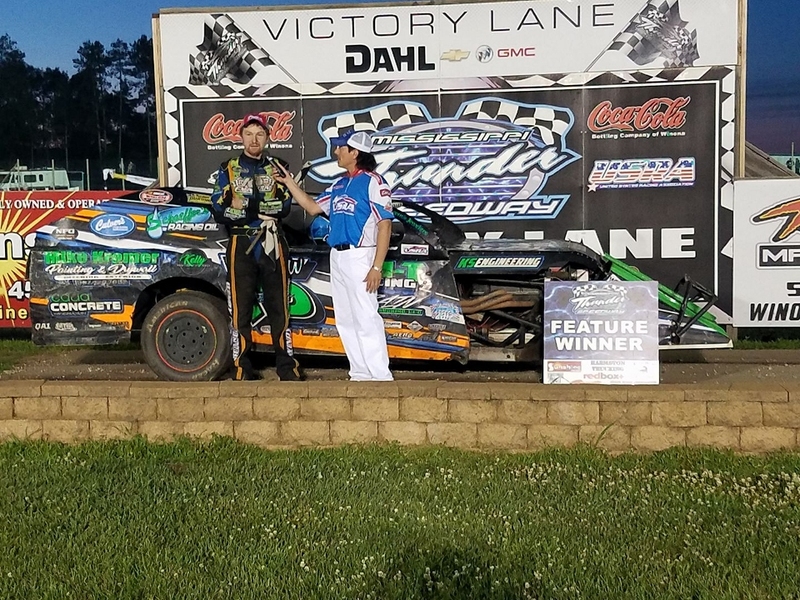 Brady Link and Lance Hofer did the same thing - in the USRA Hobby Stock and USRA Late Model divisions, respectively - jumping out front of their feature races on the way to their second feature wins in as many weeks. 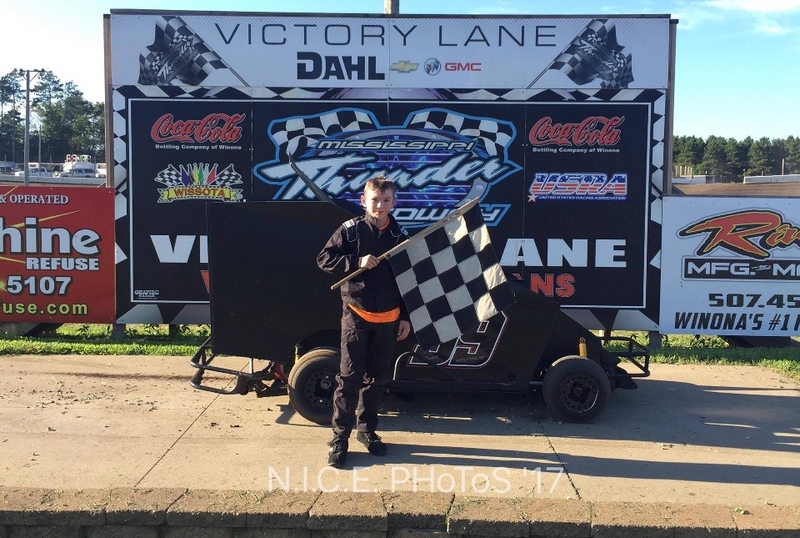 In the Black Horse Bar & Grill USRA B-Mod division, 2015 Track Champion Parker Hale stepped back into the Lime Light with a Feature win - while wearing his father's old race suit! 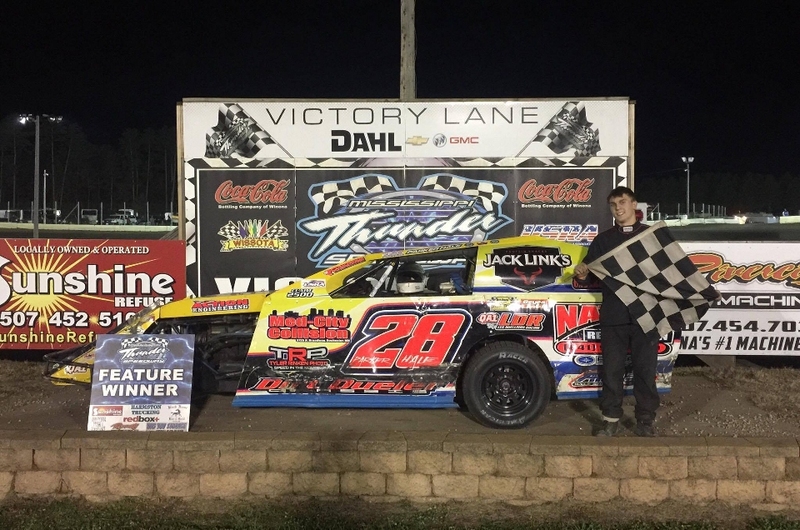 Joe Provinzino returned to MISSISSIPPI THUNDER SPEEDWAY to collect yet another 600 Mod feature win (the 30th of his career at MTS) while Brandon Gleiter rolled his #20 Harmston Trucking MTS Hornet into Victory Lane for the very first time! All in all . . . another great night of racing and fun made up evening number two of the 2017 season! True, it was a bit chilly . . . but, hey, that's late-April in the upper Mid-West. The action at the 2017 MISSISSIPPI THUNDER SPEEDWAY Season Opener more than made up for the cool temperatures with the "Hot On-Track Action" presented to the crowd on hand. 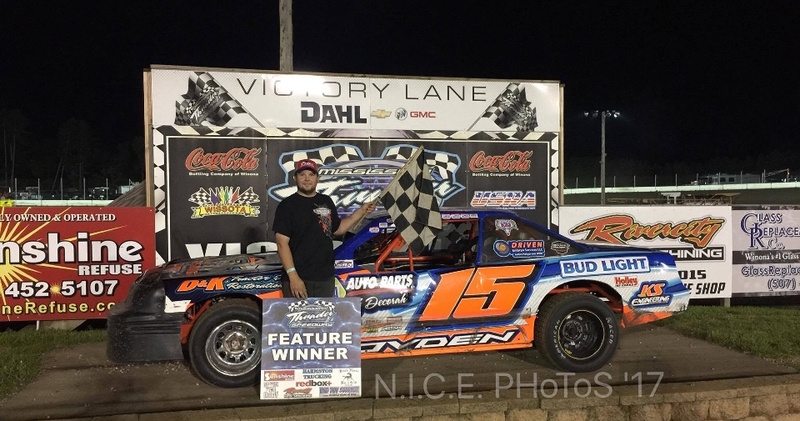 Many familiar faces, and some new names, hit the newly reconfigured MISSISSIPPI THUNDER SPEEDWAY with battles for positions, bragging rights and checkered flags. 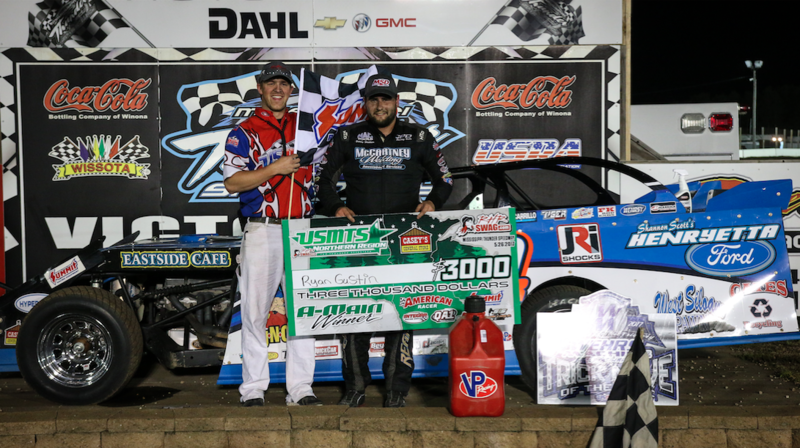 Reigning USRA National Champ, and former MISSISSIPPI THUNDER SPEEDWAY Track Champion, Lucas Schoot returned to MISSISSIPPI THUNDER SPEEDWAY in story book fashion to win the 25-lap Rivercity Manufacturing USRA Modified feature while 2015 MISSISSIPPI THUNDER SPEEDWAY Track Champion Lance Hofer raced back into the Dahl Auto Plaze Victory Lane by winning the 20-Lap Centerville Welding & Repair USRA Late Model presented by Big Toy Storage feature. Flyin' Ryan Olson used the all-new "Ultra-High Line" and every inch of the newly created 20-foot width of banking at the top of the track to grab the feature win in the Black Horse Bar & Grill USRA B-Mod feature, with other feature wins going to Chris Gilbertson (Redbox+ 600 Mods), Brady Link (Jailhouse Saloon USRA Hobby Stocks) & Pat Thicke (Harmston Trucking MTS Hornets). by March 3, 2017 . . . THE 2016 MISSISSIPPI THUNDER SPEEDWAY CHAMPIONSHIP AWARDS BANQUET! 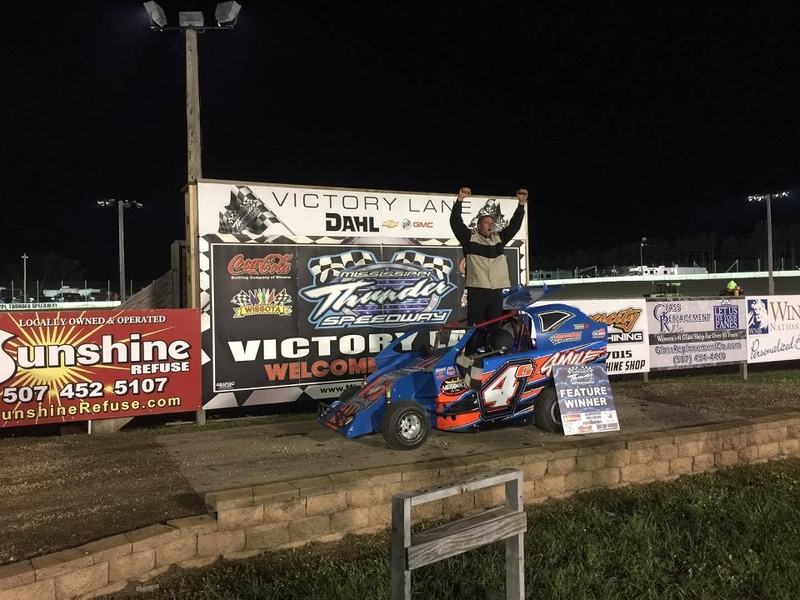 Friends, Family, Fans, and Fun; those are just a few of the aspects of local racing that continue to make it so popular. But the competition of the sport is always one of the highlights, and those who can best the competition are always rewarded. 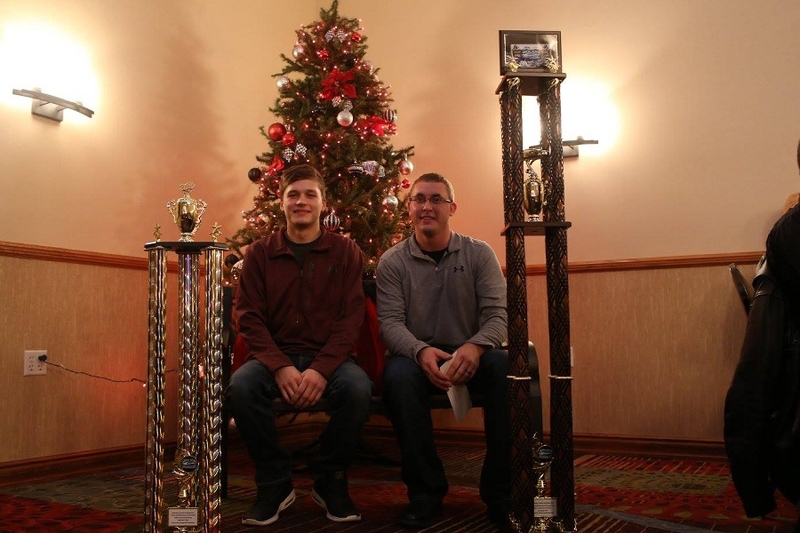 For the eighth year in a row, the racers, their families, crew members, car owners, sponsors, & speedway staff joined together at Winona's Riverport Inn & Suites to remember the completed racing season and celebrate those who enjoyed a successful season, at MISSISSIPPI THUNDER SPEEDWAY's 2016 Championship Banquet . . .
MISSISSIPPI THUNDER SPEEDWAY ANNOUNCES THE EXPANSION OF THE USRA LATE MODEL DIVISION!! At least 8 and possibly as many as 10-15 additional dates at Cedar Lake Speedway, Cresco, Decorah & West Union! MISSISSIPPI THUNDER SPEEDWAY is excited to announce some BREAKING NEWS for the USRA Late Model Division! 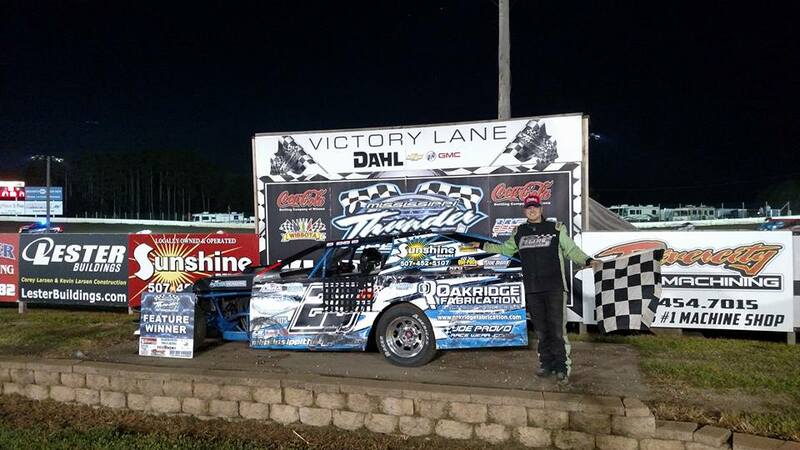 Great News for USRA Late Model Drivers! Cedar Lake Speedway has added the USRA Late Models for 7 Nights in 2017. All 7 nights will be sanctioned events. MISSISSIPPI THUNDER SPEEDWAY owner, and designer of the USRA Late Model division, Bob Timm will also be working with other tracks to to get a few more events on the schedule. 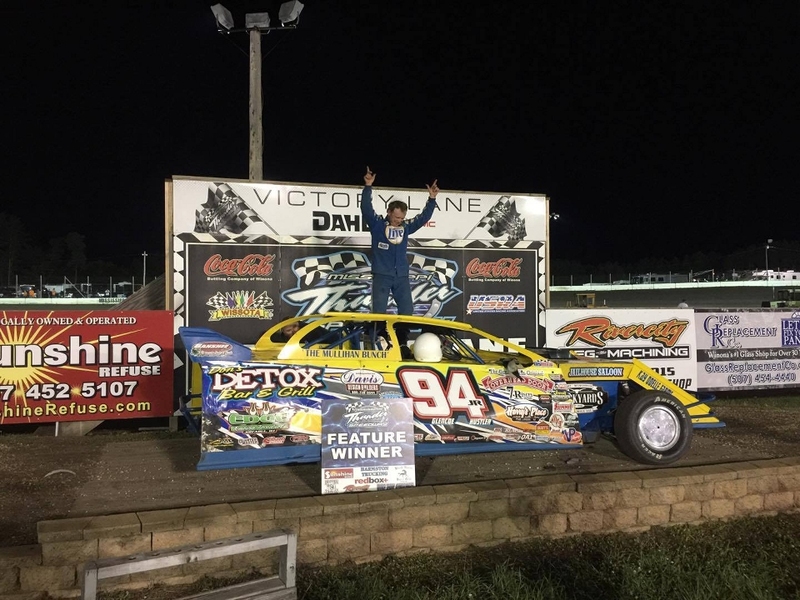 "I almost can't explain how happy I am to release this information," Timm commented about the release of this news, "The expansion of this division to other tracks on other dates is integral to the growth of what I feel might be the saving of weekly Dirt Late Model racing in our area!" Sept 14th - (Thursday night of Legendary 100)! There will also likely be one night at Cresco, 1 or 2 nights at Decorah and a few nights at West Union! Additional dates will be posted as soon as they are lined up and confirmed! MISSISSIPPI THUNDER SPEEDWAY is pleased to release details of the upcoming 2017 CHAMPIONSHIP AWARDS BANQUET, which will wrap up what was an exciting and successful 2017 season at one of the favorite dirt tracks of fans & drivers alike in the upper mid-west! 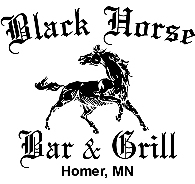 The 2017 MISSISSIPPI THUNDER SPEEDWAY CHAMPIONSHIP AWARDS BANQUET will be on Saturday, January 20th at The Black Horse Bar and Grill in Winona, MN. Ticket Prices are only $10 for adults & just $5 for children (12 & under). Door prizes will be given away through the night. There will be appetizers and two half barrels of beer on the house! In an effort to make sure that the evening is both fun and safe, MISSISSIPPI THUNDER SPEEDWAY is making sure that Transportation to the Plaza, Holiday Inn Express, and Riverport will be available. Come out and help us celebrate the 2017 Race Season! Call/ Text 608-687-3282 or email marketing5@gmail.com and get your tickets today. Ticket sales will be in advance only. Payment is due by Wednesday, January 10th. Tickets will be picked up at the door. Send money to: MTS 1140 72nd Ave Minnesota City, MN 55959. We will reserve 8 long tables for the 2017 Track Champions. No other table reservations will be taken. For more information, call us 608-687-3282. The 2017 MISSISSIPPI THUNDER SPEEDWAY CHAMPIONSHIP AWARDS BANQUET is open to the public. 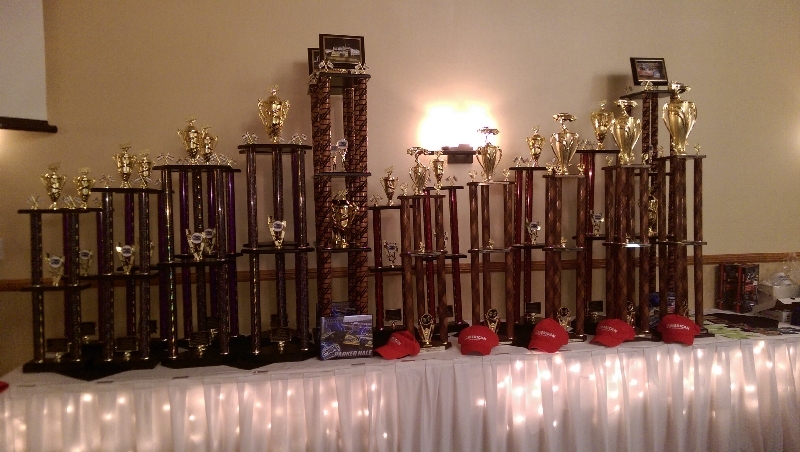 While a majority of the attendees are racers who will be receiving awards, it is a great night for family members, sponsors and fans as well to spend the evening with the recipients and enjoy the fun & relaxing evening as trophies are awarded to drivers who finished in the Top-5 in the track point standings in each class that competed at MISSISSIPPI THUNDER SPEEDWAY throughout the 2017 season. ARTICLE COVERING MISSISSIPPI THUNDER SPEEDWAY USRA LATE MODELS! MISSISSIPPI THUNDER SPEEDWAY continues to receive exciting coverage about our up-coming 2017 racing season! 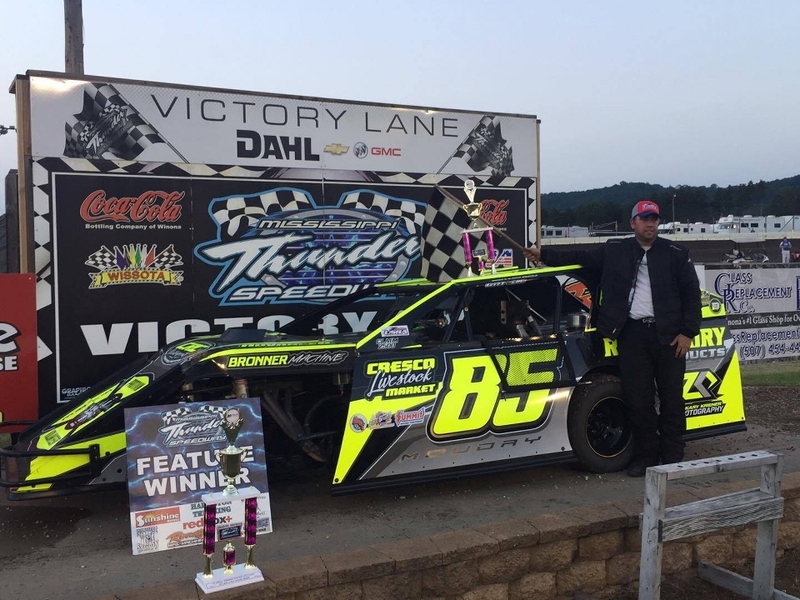 Recently USRARacing.com posted a great article about the USRA Late Models . . . Please mark your calendars and support as many of these events as you can . 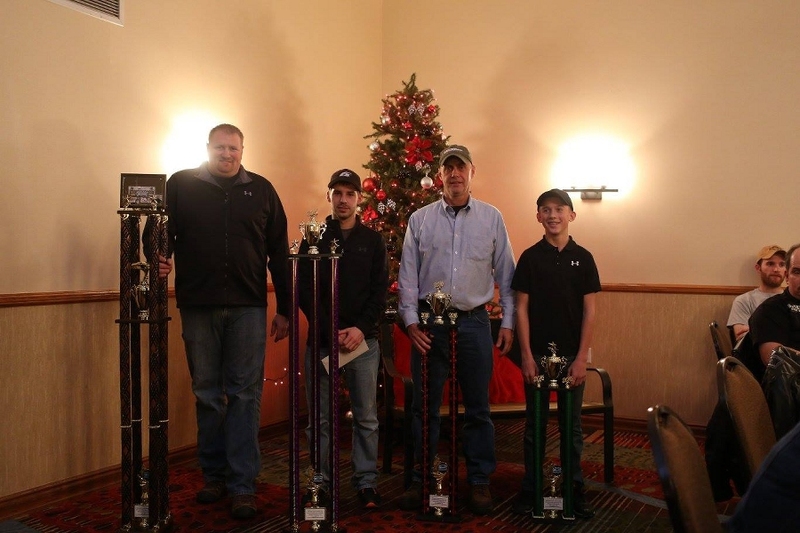 . .
Read the article, which can be viewed on the USRA web site. MISSISSIPPI THUNDER SPEEDWAY is looking forward to an EXCITING & FUN 2017 LATE MODEL season!!! MISSISSIPPI THUNDER SPEEDWAY RELEASES BEAUTIFUL FULL-COLOR SCHEDULE FOR 2017 SEASON! MISSISSIPPI THUNDER SPEEDWAY is happy to release a printable FULL-COLOR copy of the schedule for the upcoming 2017 season. 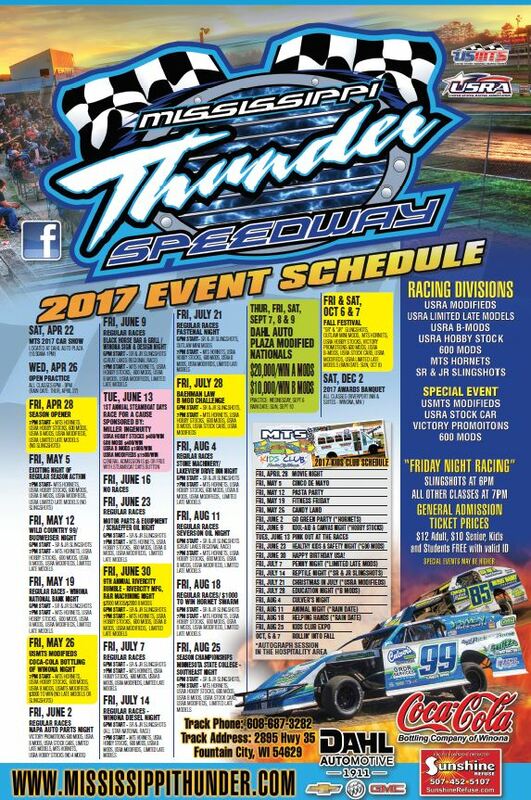 "We are glad to provide this printable copy of our 2017 schedule", said MTS Marketing / Event Coordinator Kasi Johnson, "so that racers, fans, sponsors, and supporters can print a copy and hang it in a convinient place so that they'll always know what's coming up next at MISSISSIPPI THUNDER SPEEDWAY!" MISSISSIPPI THUNDER SPEEDWAY RELEASES 2017 SEASON SCHEDULE! MISSISSIPPI THUNDER SPEEDWAY began the new year of 2017 by releasing initial details for what looks to be an amazing and exciting 9th year of action at the fast, wide and racy "BIG 1/3-MILE" situated just an echo away from the banks of the Mighty Mississippi River which creates the border between West-Central Wisconsin and South-Eastern Minnesota! A tentative 2017 season schedule has been put together which once again presents all the ingredients necessary to make Friday Nights at MISSISSIPPI THUNDER SPEEDWAY the "Must Be There" destination for racers and race fans alike! The tentative 2017 schedule gets the green flag compliments of an open invitation to both racers and fans with the 2017 car show scheduled for Saturday April 22nd at Dahl Auto Plaza in their brand new state-of-the-art dealership at 1201 W Hwy 61 in Winona. The tentative 2017 MISSISSIPPI THUNDER SPEEDWAY Schedule can be viewed on the web site's "Schedule" page. MISSISSIPPI THUNDER SPEEDWAY is truly excited to be looking forward to the 2017 season - and we hope you will join us for a EXCITING, FUN and FAMILY FRIENDLY FRIDAY NIGHTS!!! MISSISSIPPI THUNDER SPEEDWAY CONTINUES THE EXPANSION OF THE USRA LATE MODEL DIVISION!! National Points Fund, National Champion along with additional dates at Cedar Lake Speedway, Upper Iowa Speedway, West Union, Cresco, & Red Cedar Speedway! 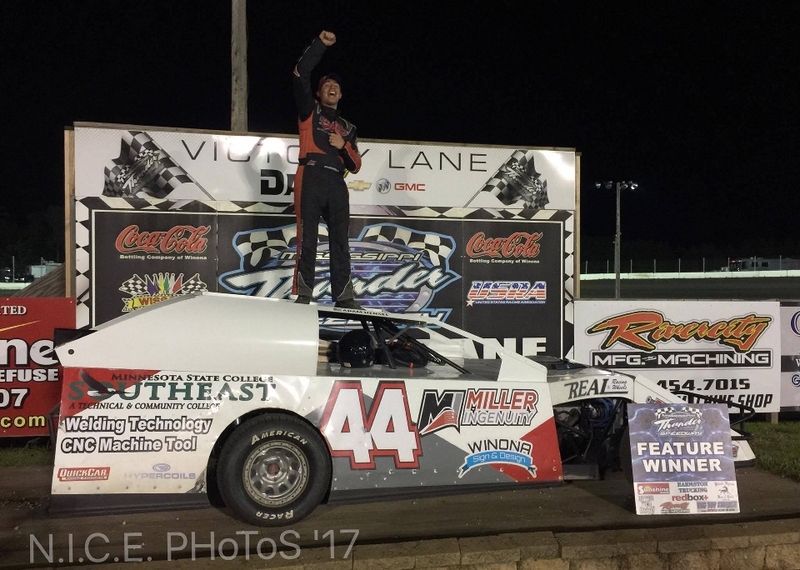 MISSISSIPPI THUNDER SPEEDWAY continues to ride a wave of enthusiasm with more BREAKING NEWS for the USRA Late Model Division! New for 2017, USRA will be having a National Point Fund for Late Models and will crown a National Champion for the class! Thanks to USRA and Boubin tire for their support of the Late Model class! MISSISSIPPI THUNDER SPEEDWAY owner/promoter Bob Timm explained via social media, "I have also been working hard with other area tracks to put together some races so drivers in this class can race more and travel to some new venues. A big thanks to Cedar Lake Speedway, Upper Iowa Speedway, West Union, Cresco, and Red Cedar Speedway for working togther to schedule another 18 races for USRA Late Models in 2017!" Please mark your schedules and try to support as many of these events as you can so we can keep them going! Stay tuned as we may be adding one or two more event to this schedule. MISSISSIPPI THUNDER SPEEDWAY RELEASES DETAILS OF CHARITABLE GIVING THROUGH THE 2016 SEASON!! MTS raised almost $24,000 for organizations and fans via the "MISSISSIPPI THUNDER SPEEDWAY 50/50 FUNdraiser" during the 2016 season! MISSISSIPPI THUNDER SPEEDWAY owners Bob & Paula Timm and Tom & Tina Lockner know that race fans are a supportive group . . . given the opportunity to have a little fun while, at the same time, providing out-of-pocket support for a local charity -- they'll gladly open their purse or wallet and get involved. That's almost $24,000 in total ($23,532 to be exact) . . .